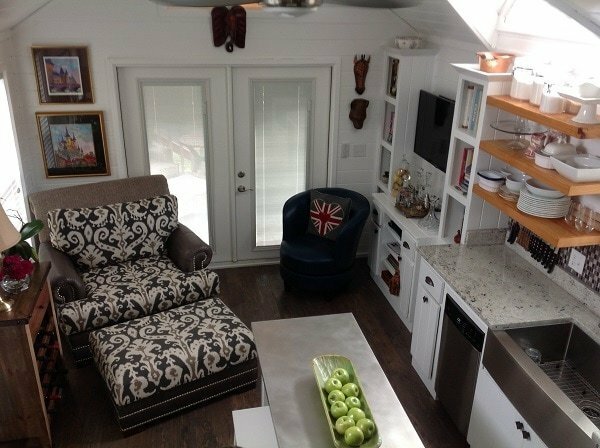 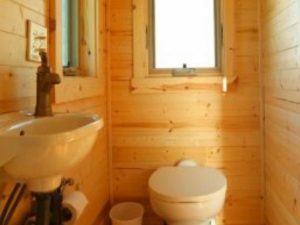 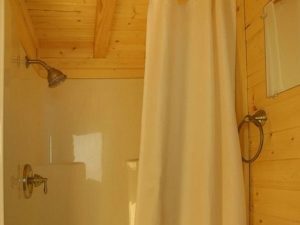 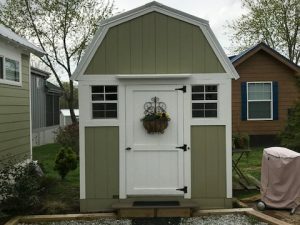 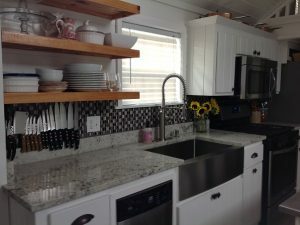 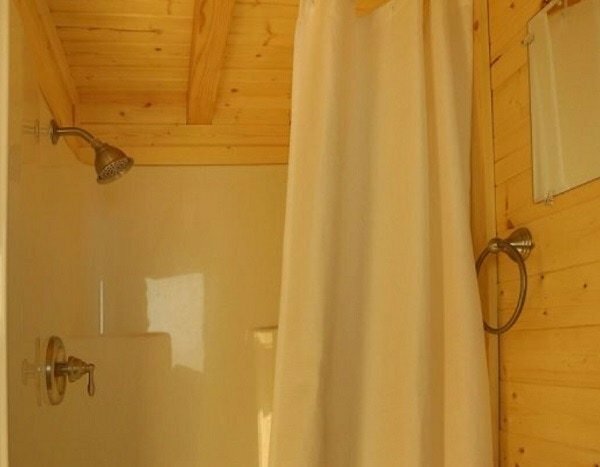 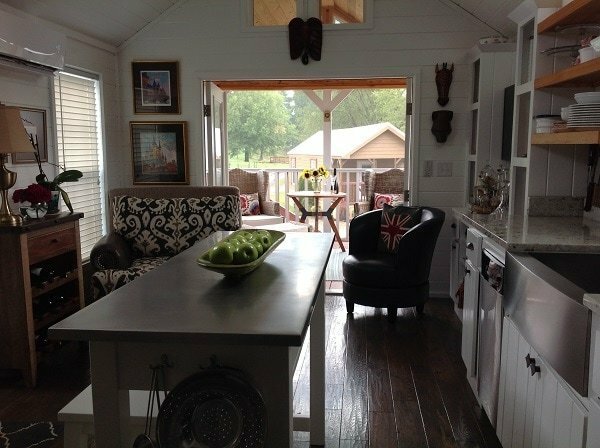 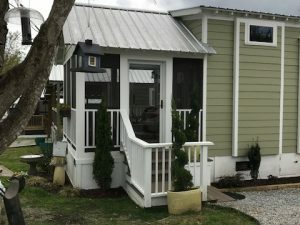 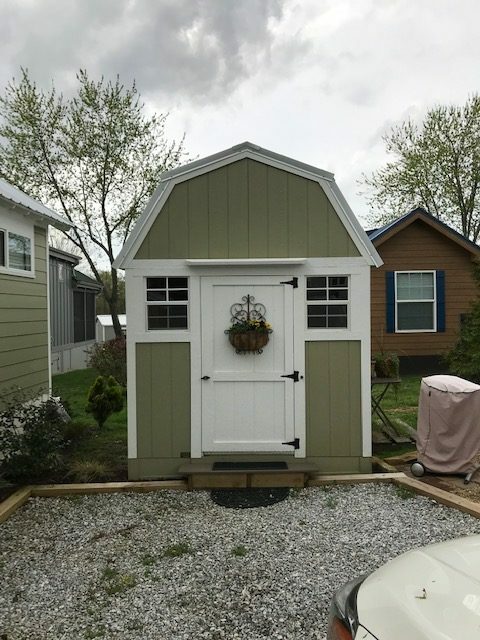 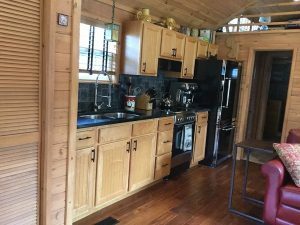 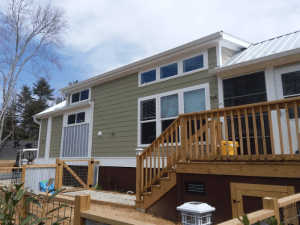 Simple Life currently has several previously owned tiny homes for sale at great prices. 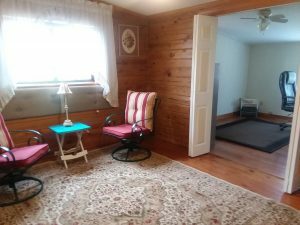 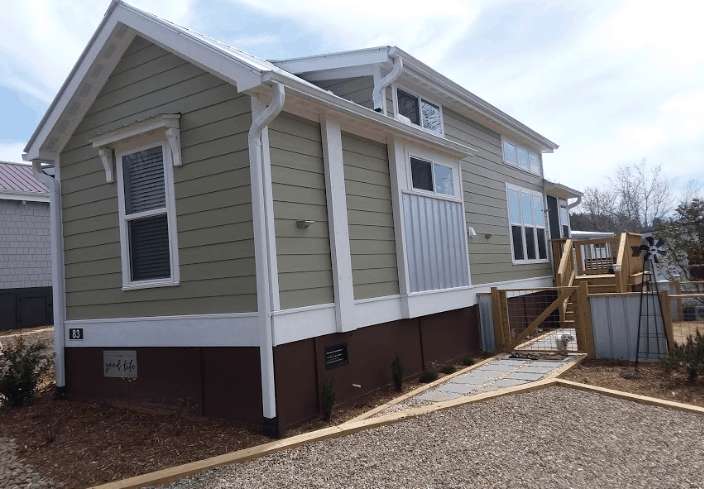 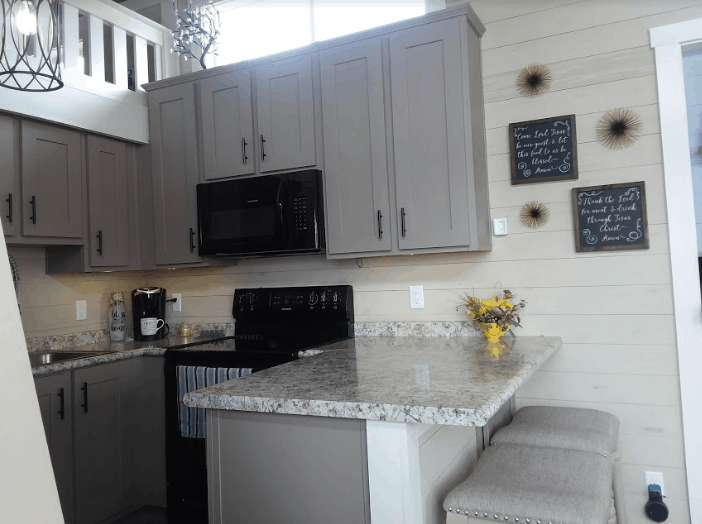 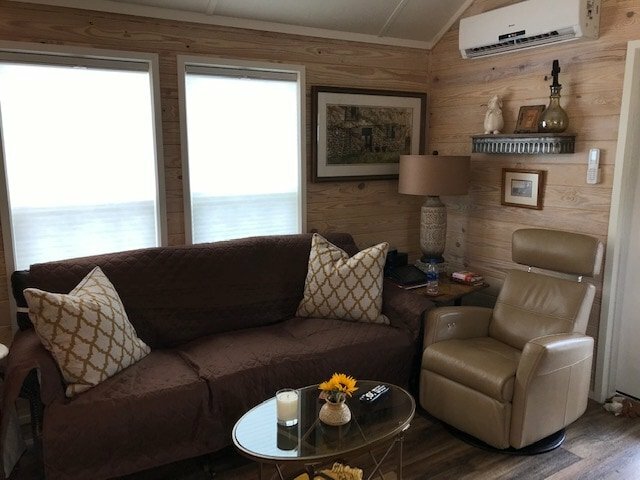 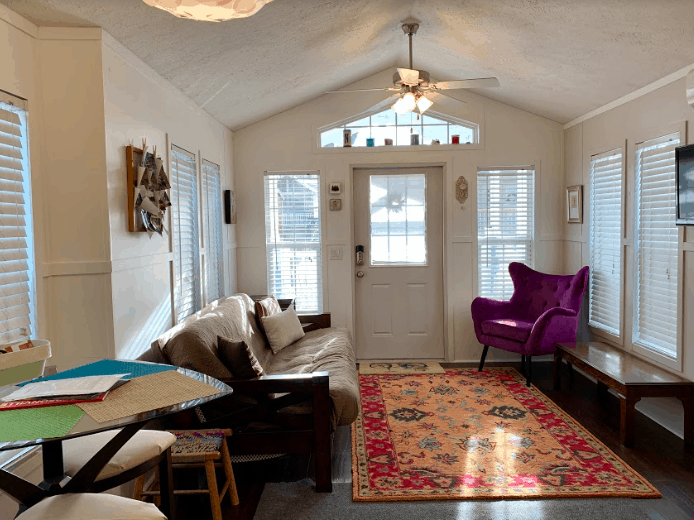 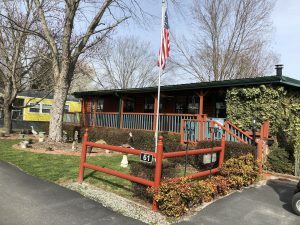 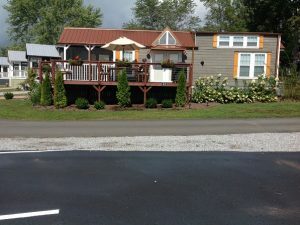 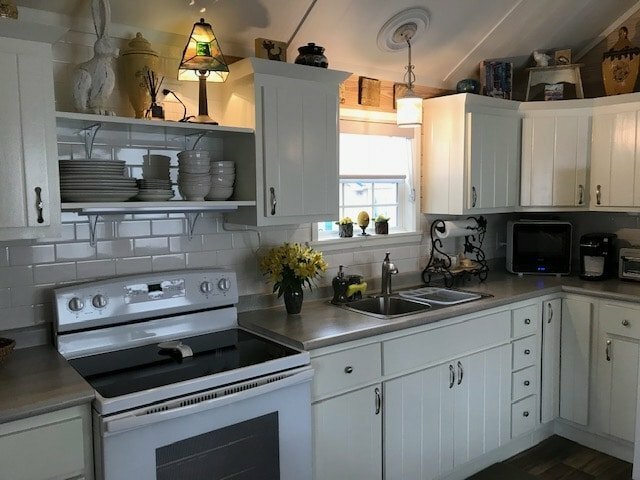 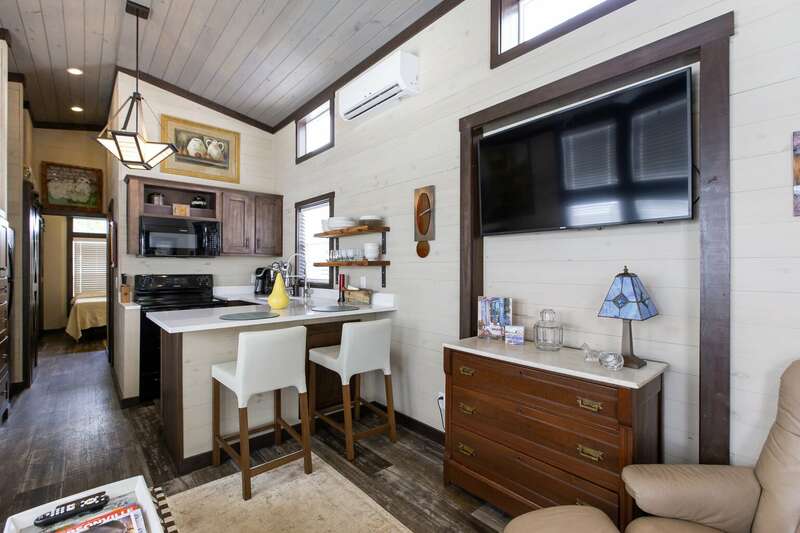 Unique, attractive, and often highly stylized with landscaping and interior customization, our pre-owned cottages can be a great way to begin living the tiny lifestyle you’ve imagined. 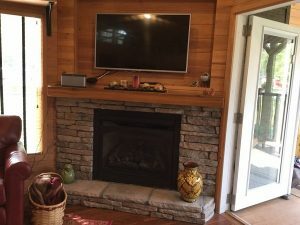 Scroll down to see what’s available now! 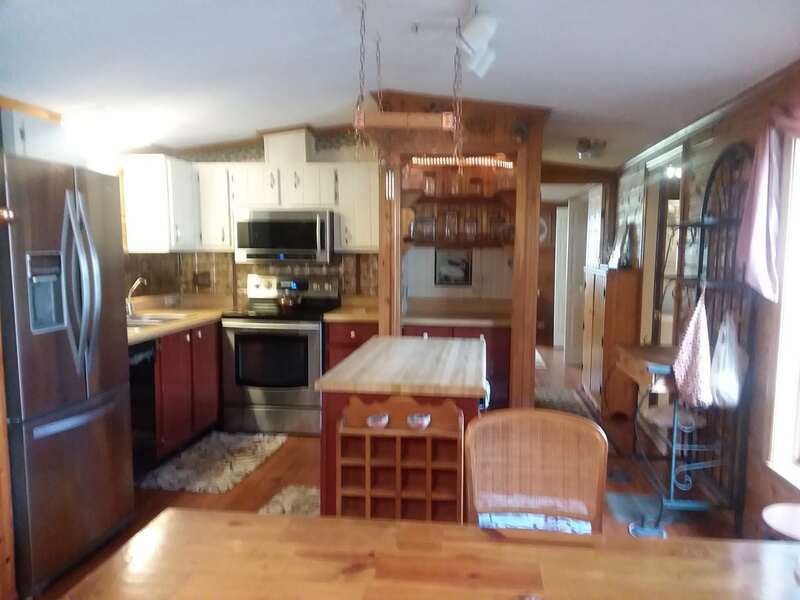 This beautiful home has recently been reduced in price at an incredible value! 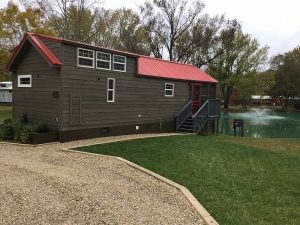 This home features a Rustic River “Comal” Floor Plan built in 2016 with a modern, unique ‘copper’ roof and gutters. 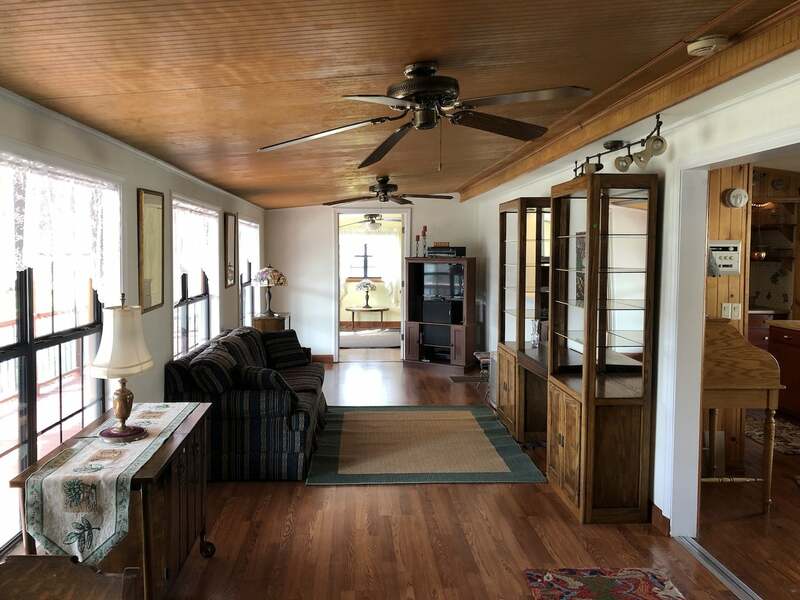 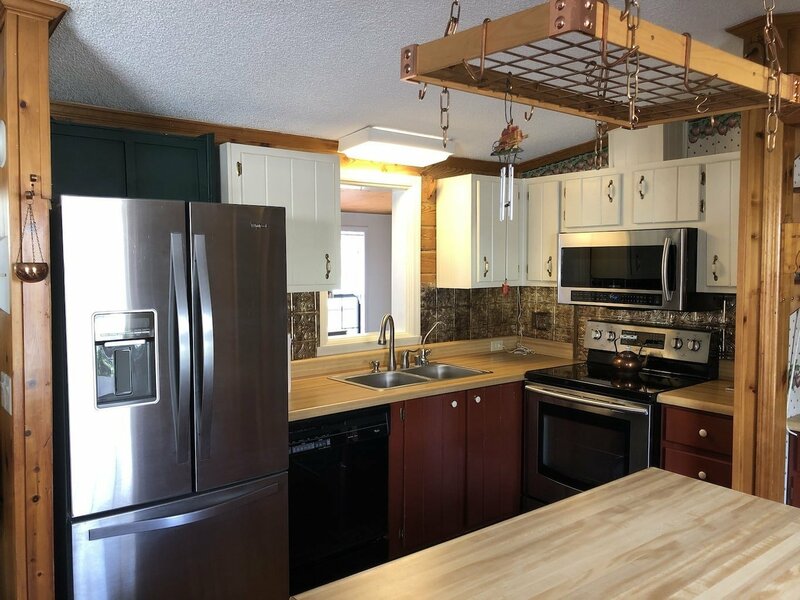 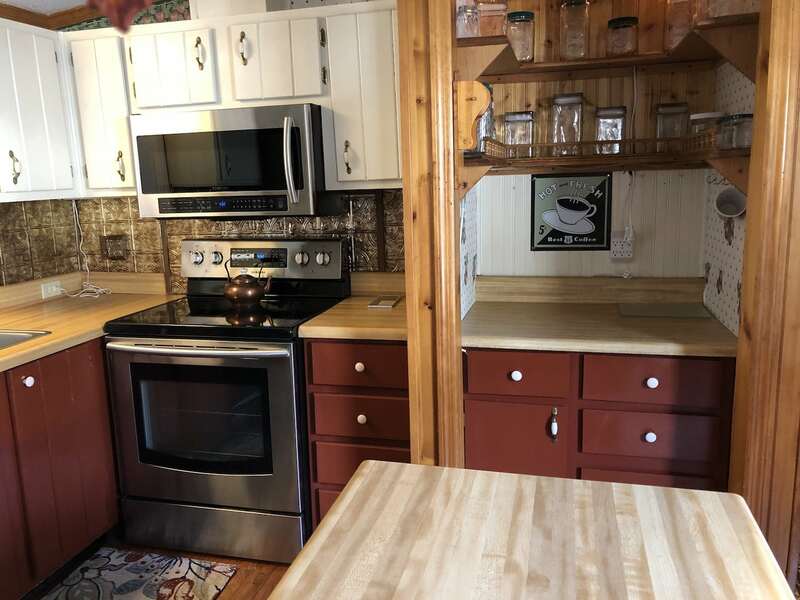 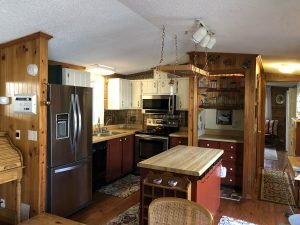 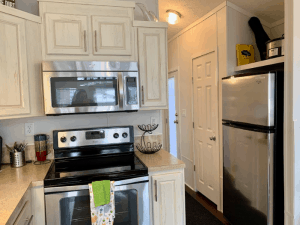 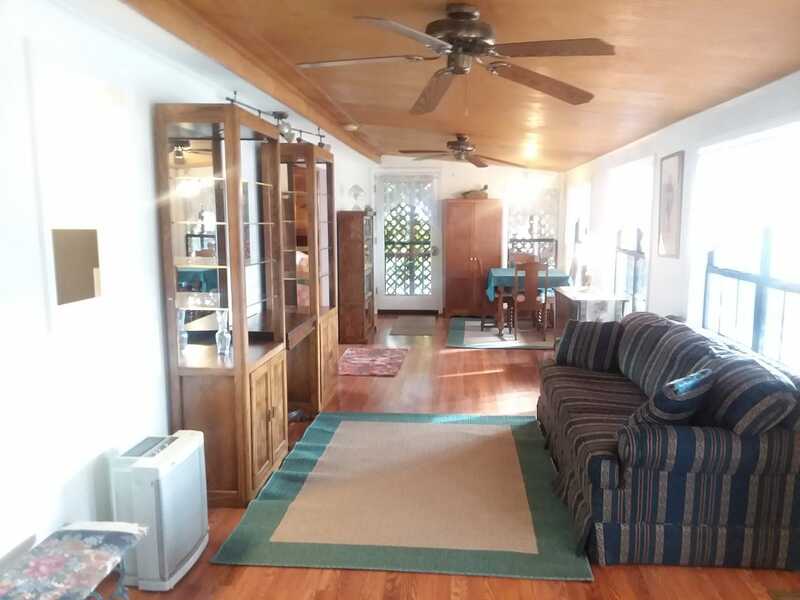 The interior includes hardwood floors on the main level and a well-appointed kitchen with stainless steel appliances including a French-door refrigerator, dishwasher, farm sink, granite counter tops, and a gas stove. 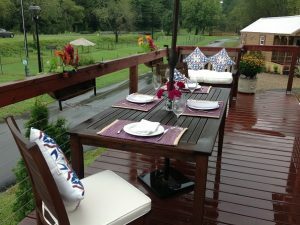 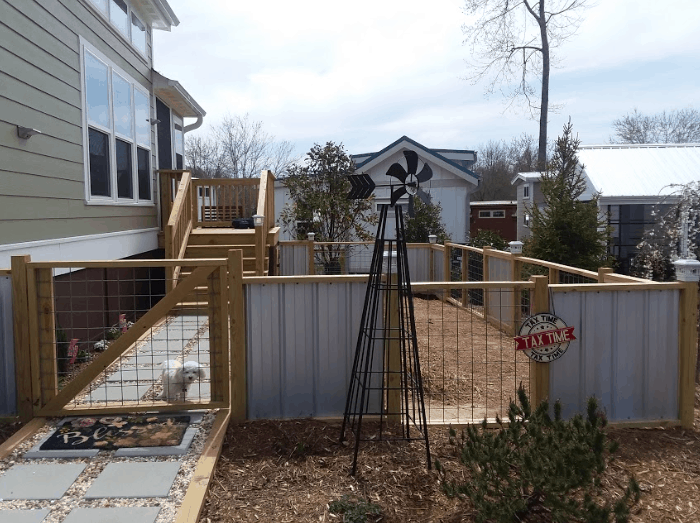 This home also includes plenty of space for outdoor living at its finest with a deck that features comfortable seating for six or more guests and a gas grill. 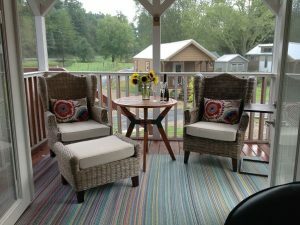 An added bonus is the separate private screened porch for more intimate gatherings. 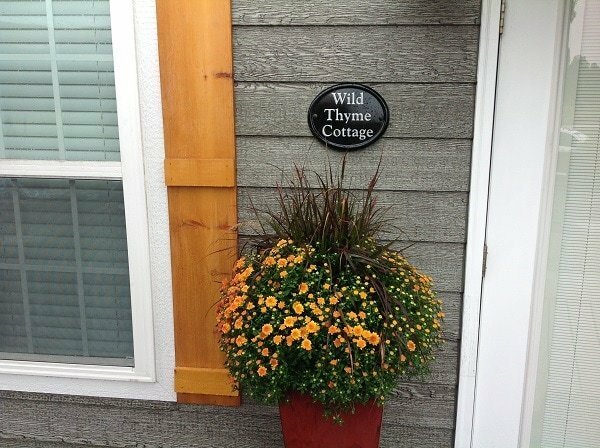 Wild Thyme Cottage is located on a generous size homesite near the main entrance to The Village for easy entry and egress. 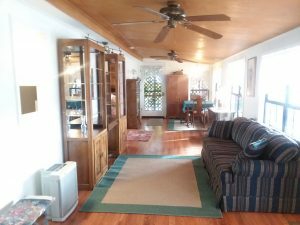 Ask about purchasing this home partially or fully furnished for an additional cost! To schedule a showing please contact one of our sales professionals at 828-707-0969. 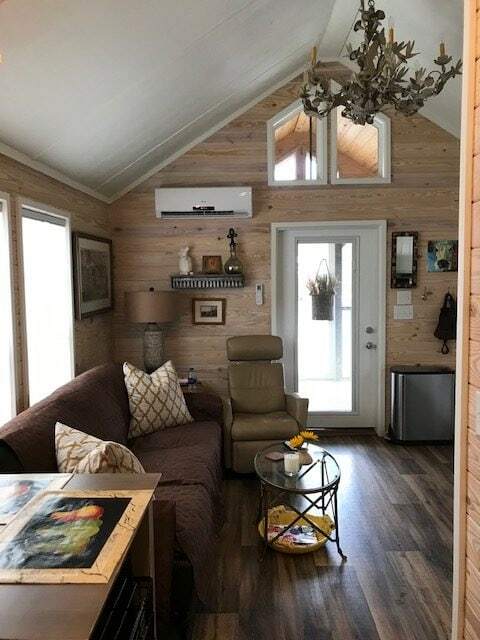 Aptly named ‘The Good Life,’ this custom 2019 Clayton Alexander features all the necessities to live well! 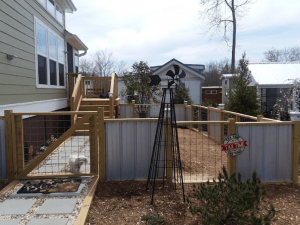 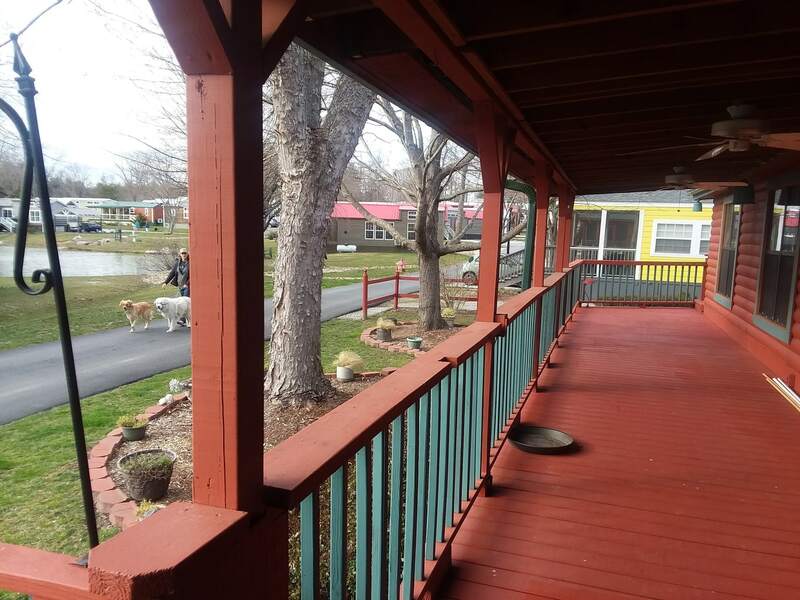 A spacious and beautifully landscaped lot welcomes you into an attractive fenced courtyard that is perfect for relaxing or playing with your dog. 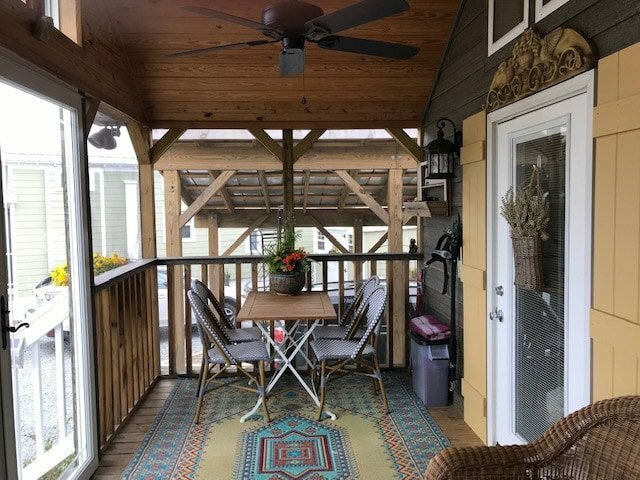 You will find a peaceful and airy covered and enclosed porch showcasing the popular Eze-Breeze Porch Enclosure System that allows you to create an indoor/outdoor living space. 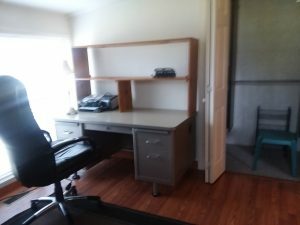 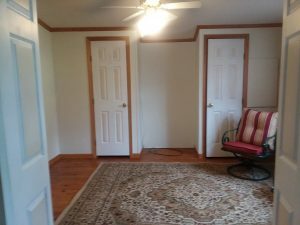 This home includes builder’s original 1-year warranty through October 2019 and the furniture is negotiable. 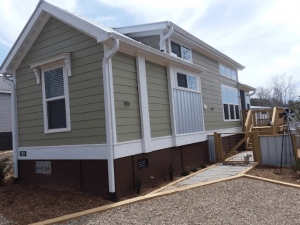 To schedule a showing please call our Sales Office at all 828.707.0969 for email info@simple-life.com. We are open Monday through Saturday 10:00 AM – 5:00PM. 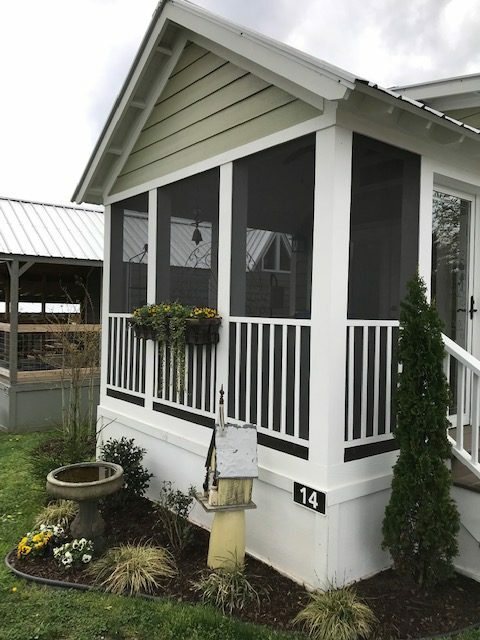 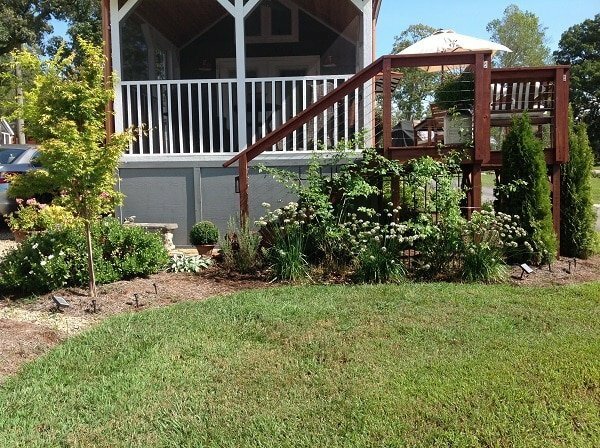 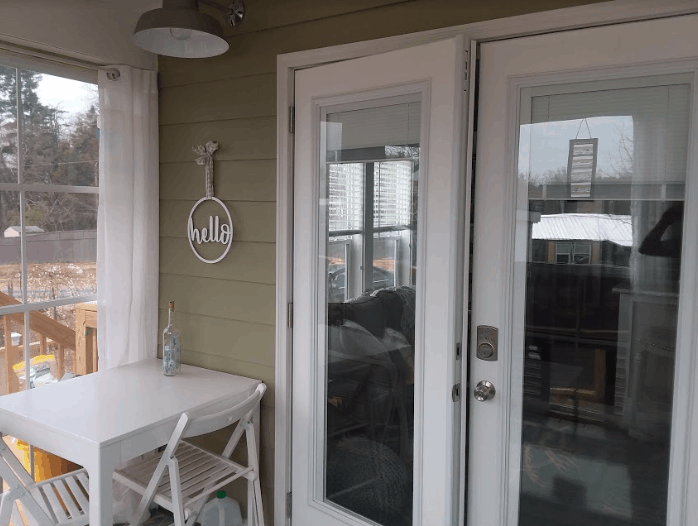 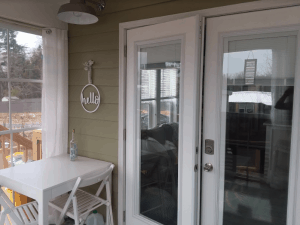 Built by Clayton Homes, this uniquely designed cottage is situated alongside Dunn Creek and features a stained pergola over the back porch perfect for relaxing to sounds of running water. 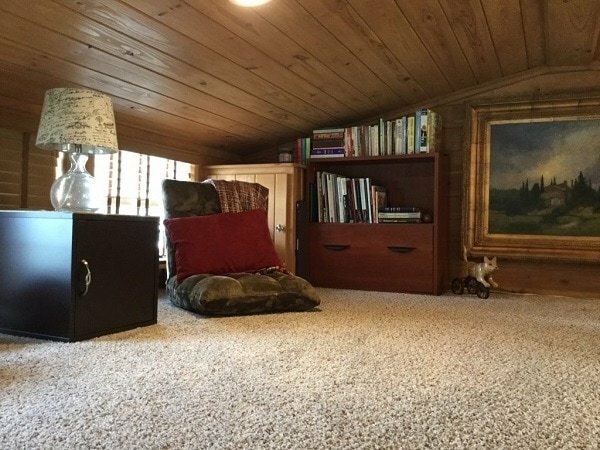 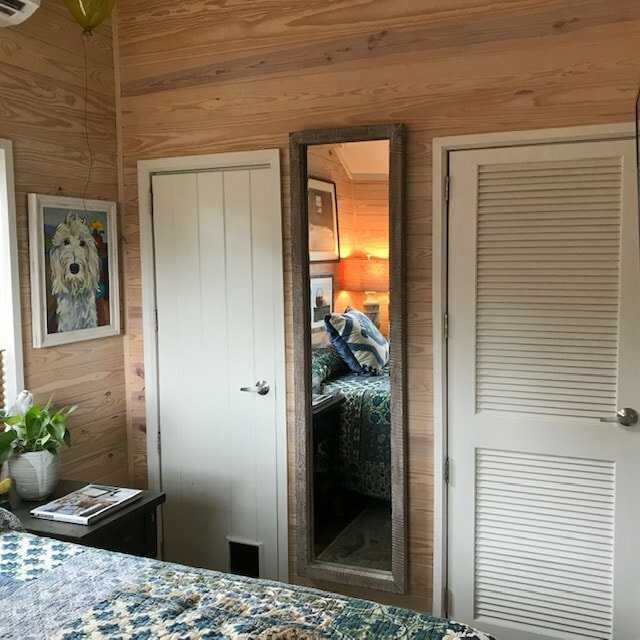 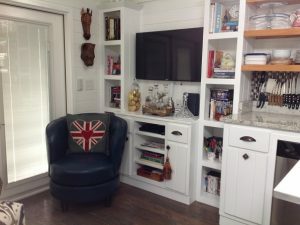 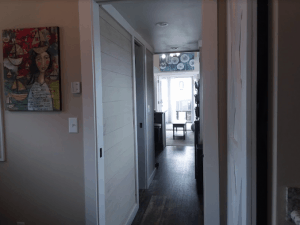 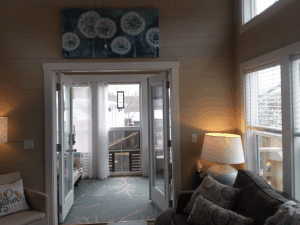 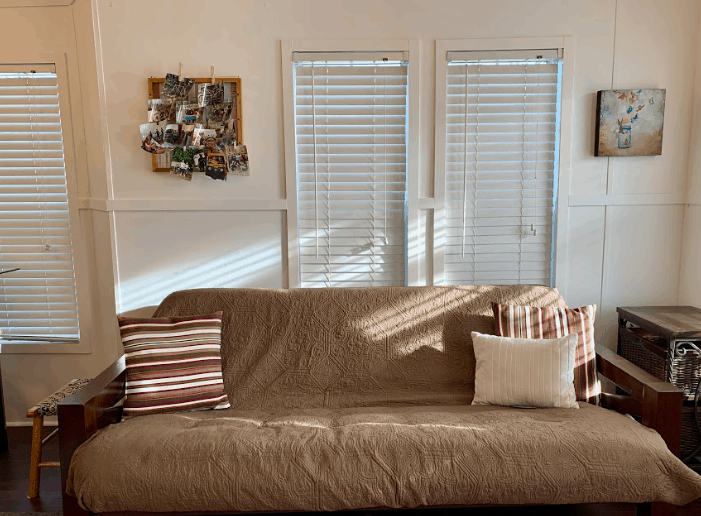 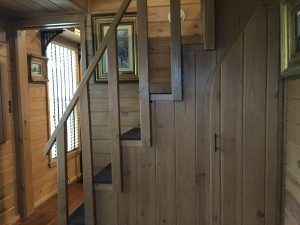 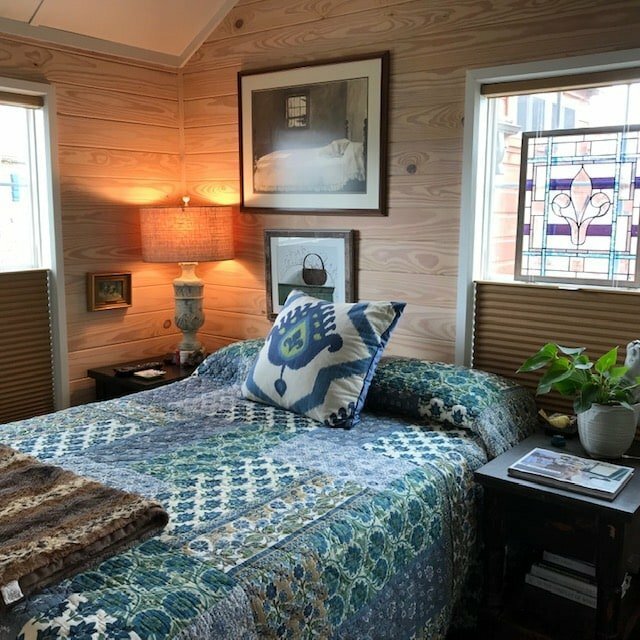 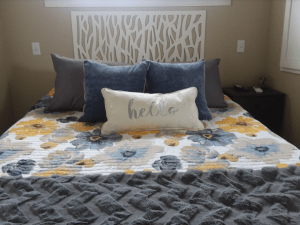 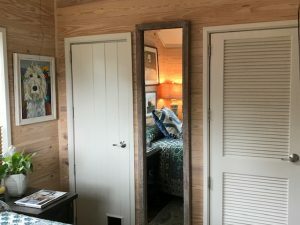 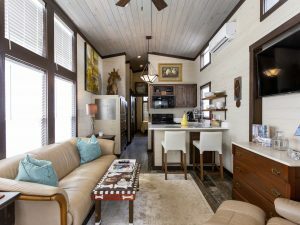 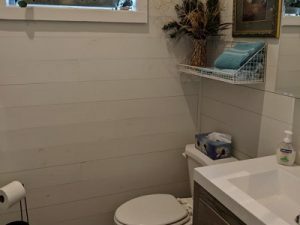 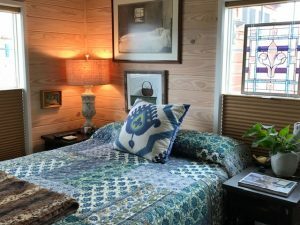 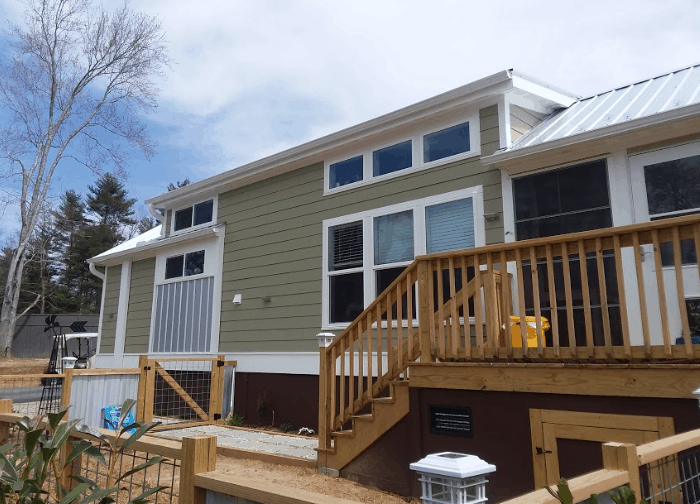 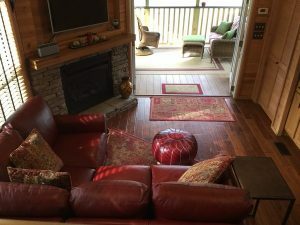 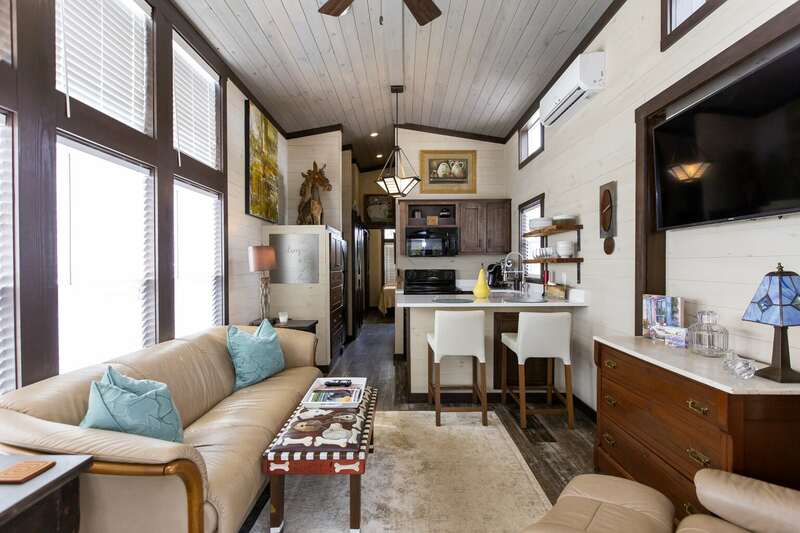 The interior is 399 square feet on the main level and has oversized windows with insulated shades that are bottom up and top down and stylish shiplap accents in the entryway and bedroom. 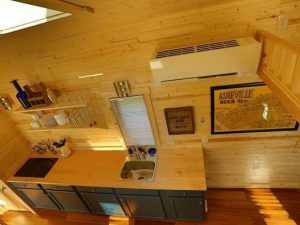 The home also features a loft for guest sleeping or extra storage, stackable washer and dryer, and full-size kitchen appliances. 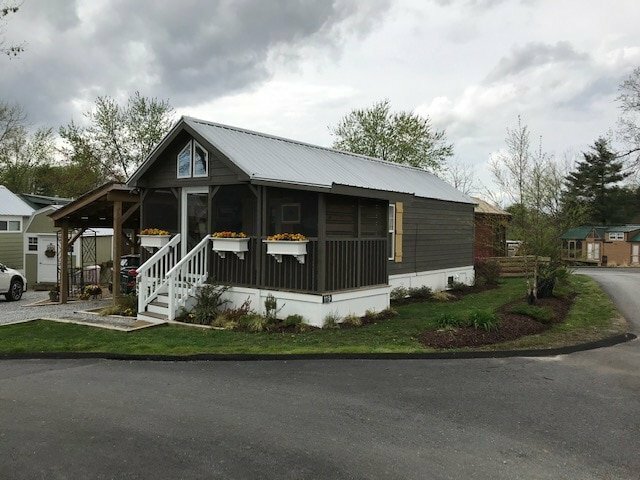 To schedule a showing, please call our Sales Office at 828.707.0969 or email info@simple-life.com. 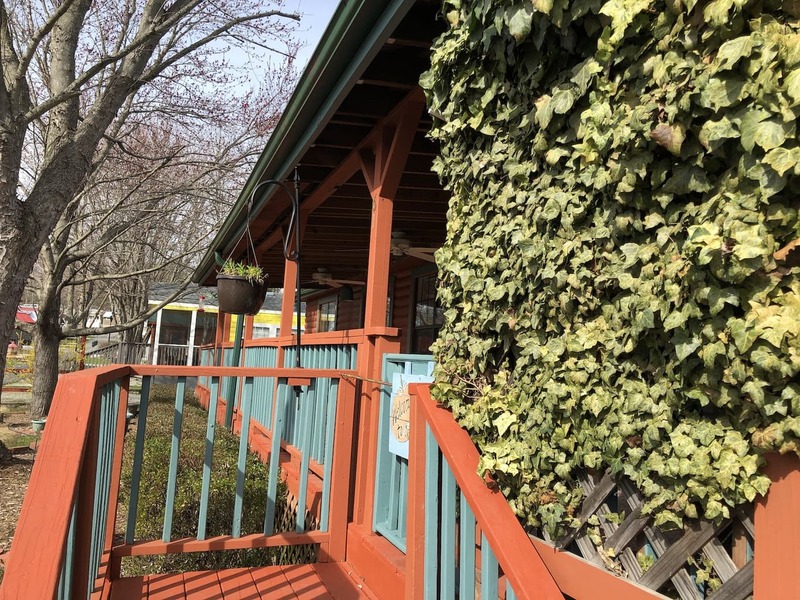 We are open Monday through Saturday 10 AM – 5 PM. 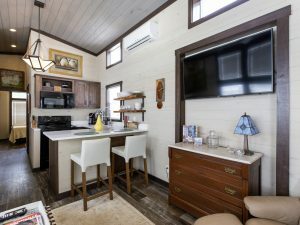 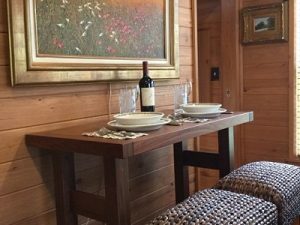 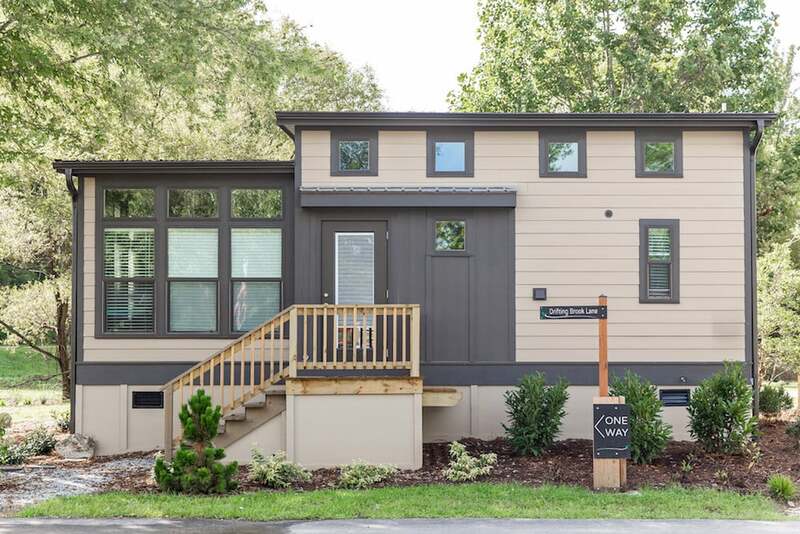 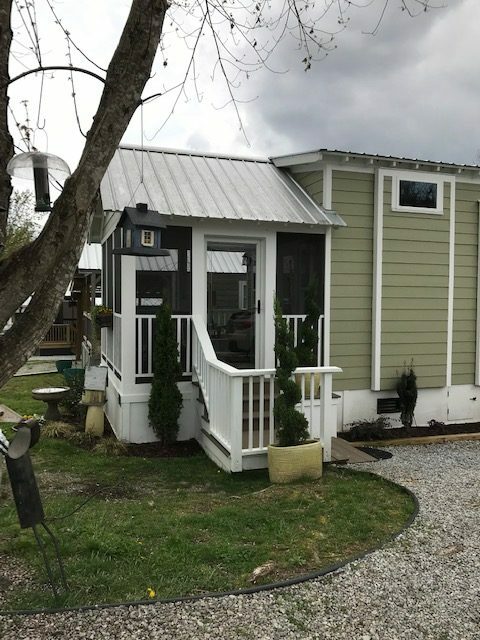 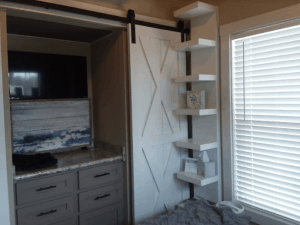 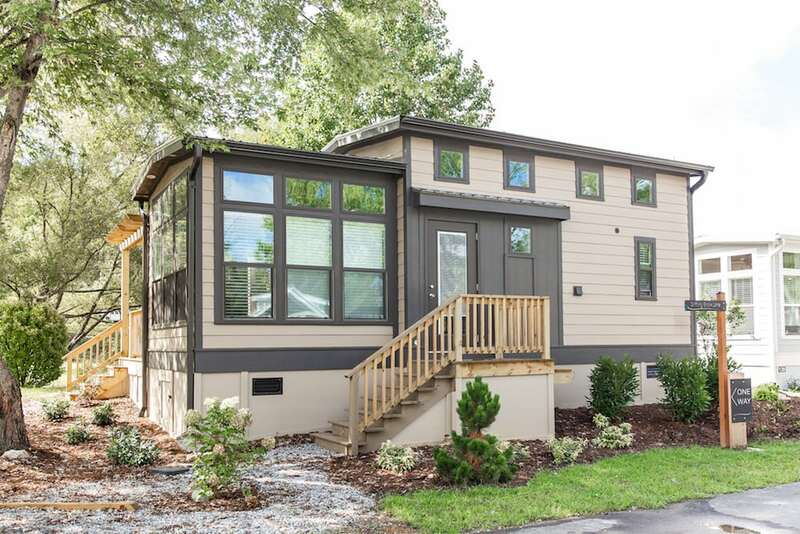 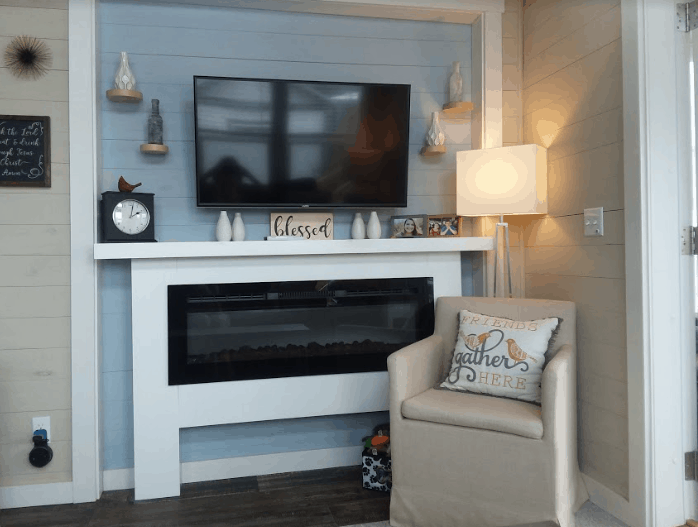 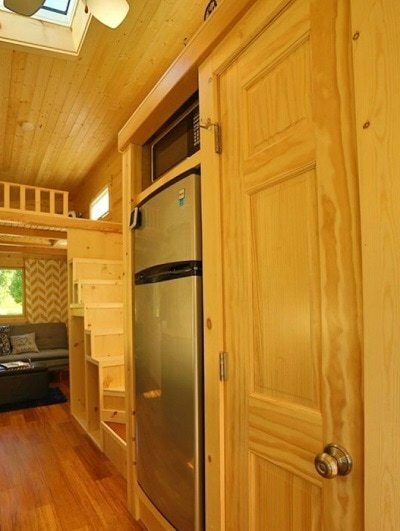 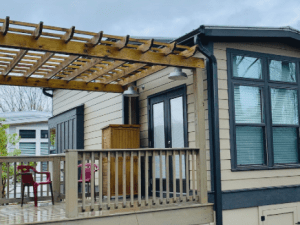 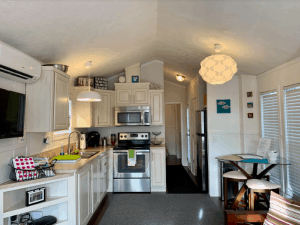 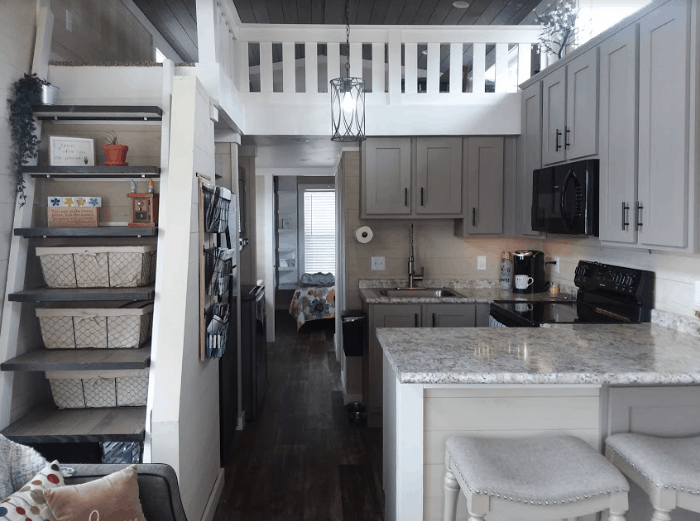 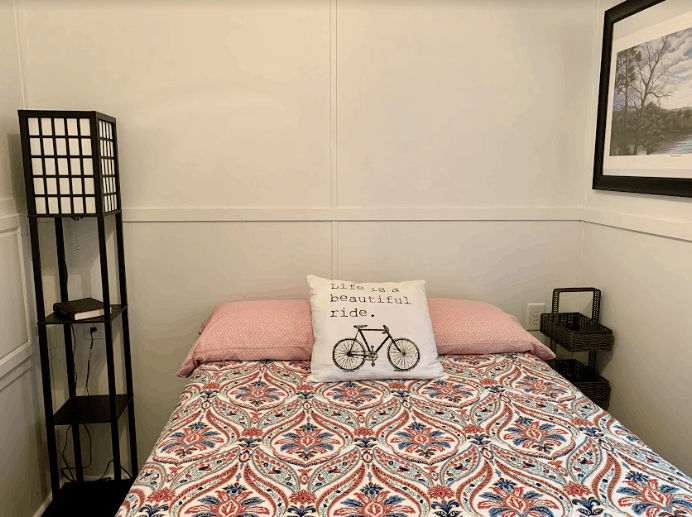 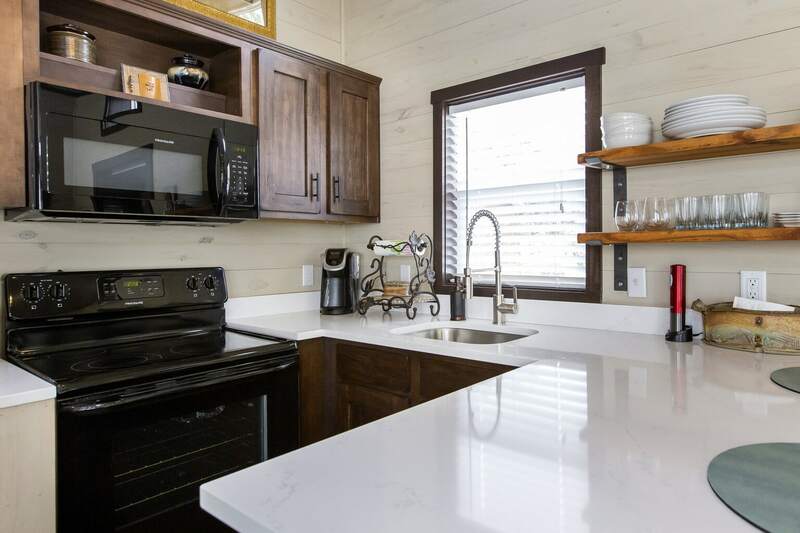 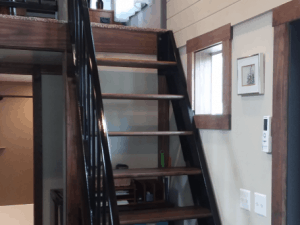 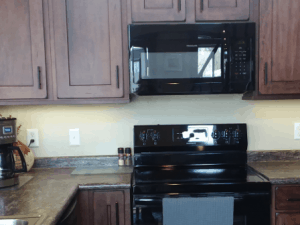 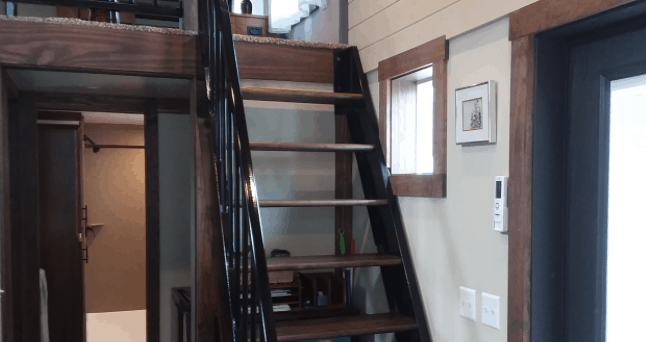 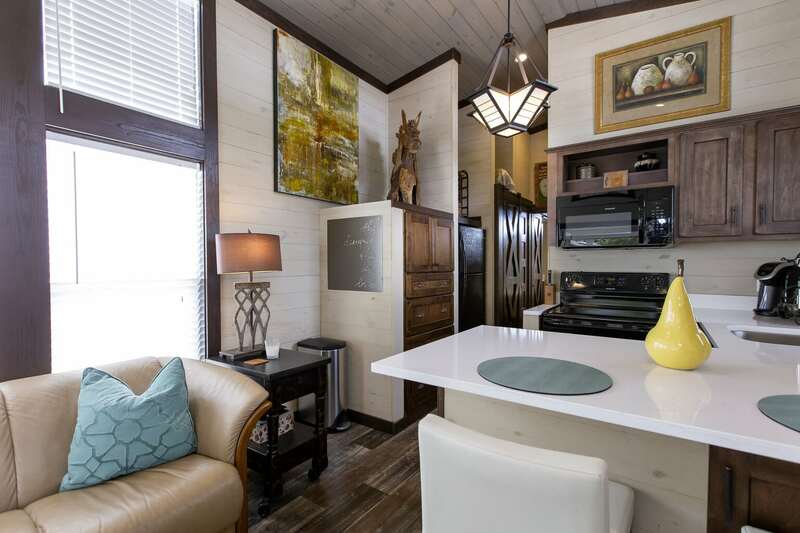 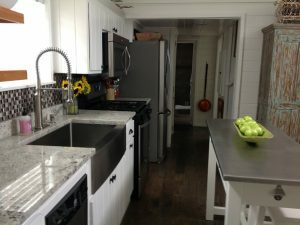 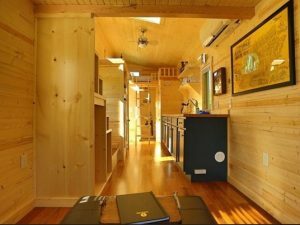 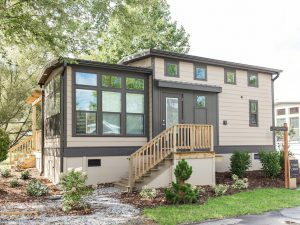 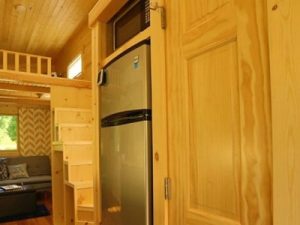 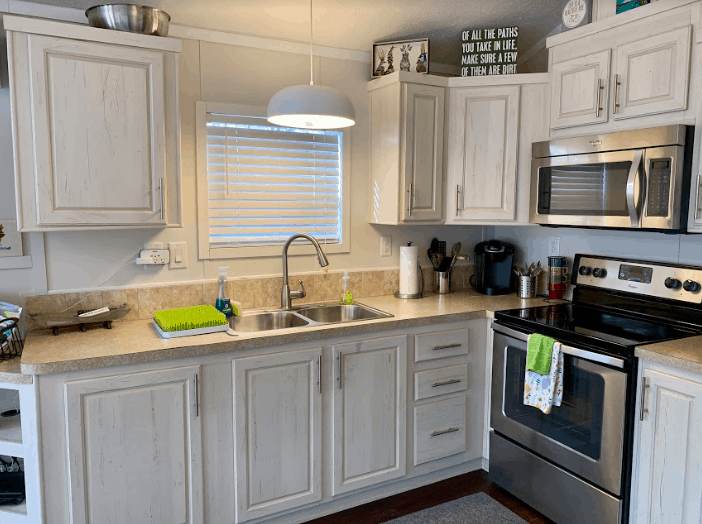 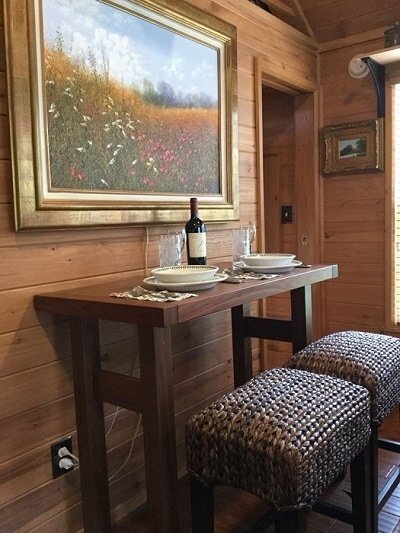 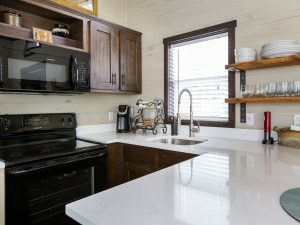 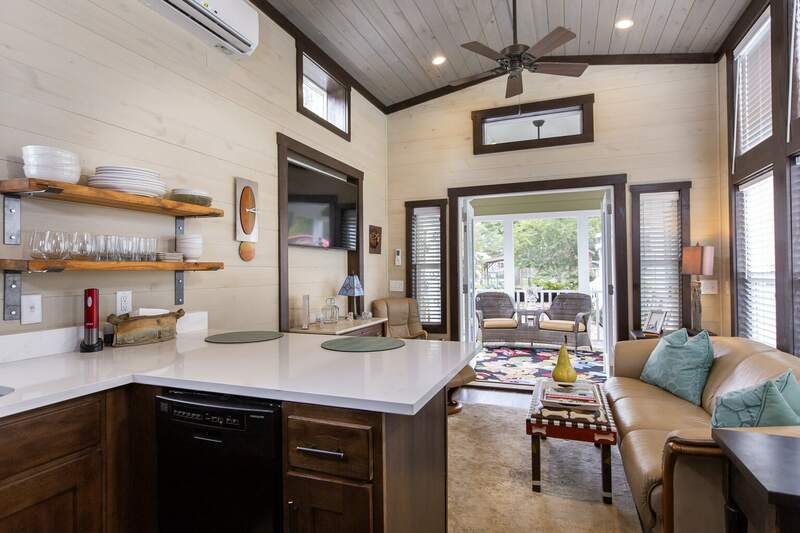 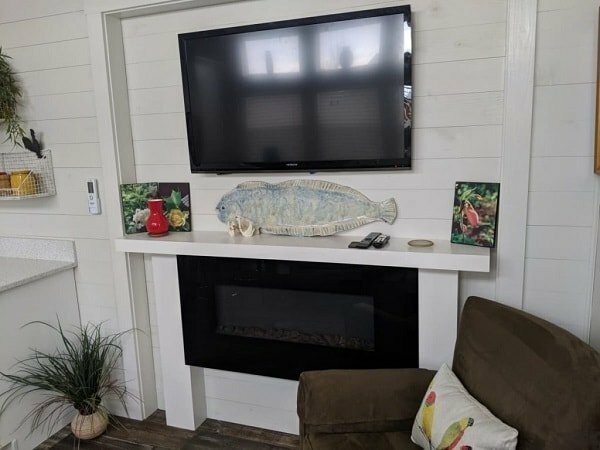 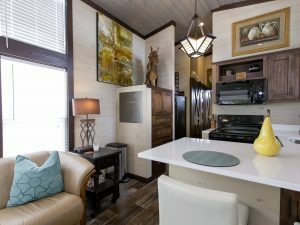 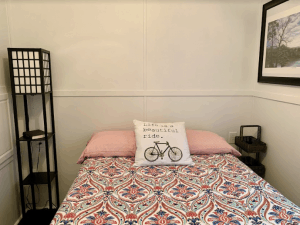 This “like” new tiny house was built in 2017 and features a custom designed kitchen with incredible storage, an electric fireplace with room for a large screen TV above in the living area, and an oversized shower with double seats and glass door in the bathroom. 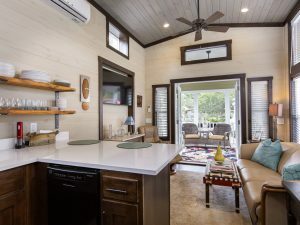 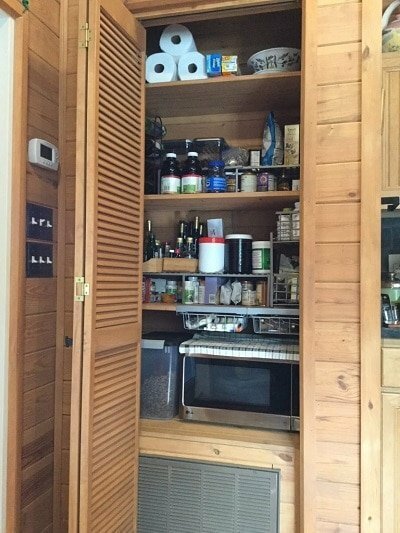 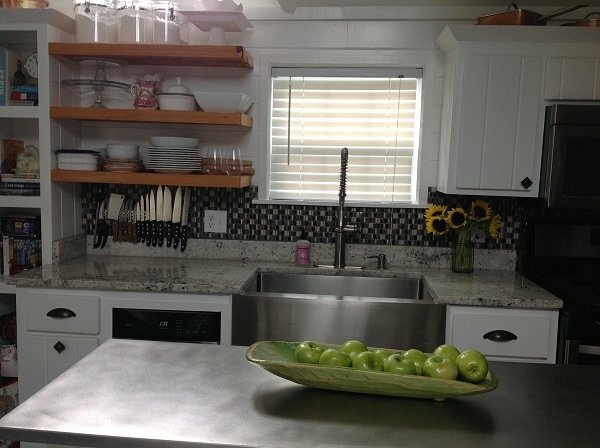 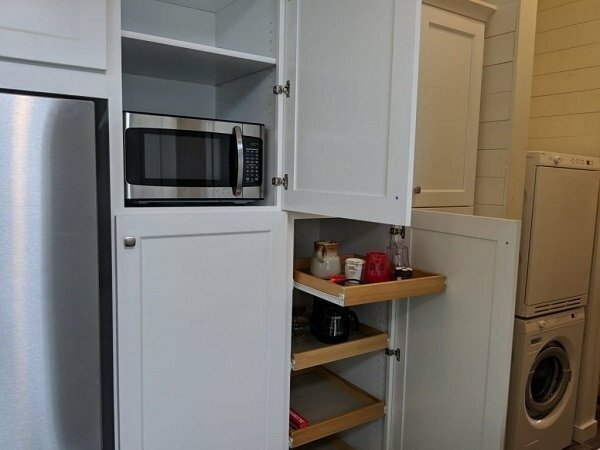 This one-of-a-kind tiny house kitchen features a pantry with pull out shelves, an inversion cooktop stove that can be stored in its own dedicated drawer, an oversized stainless steel sink, a seamless quartz countertop, and a full-sized Bromberg refrigerator with a bottom freezer. 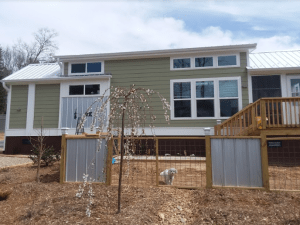 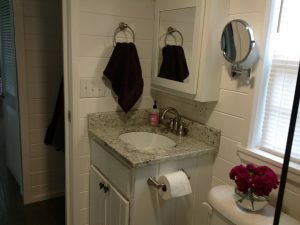 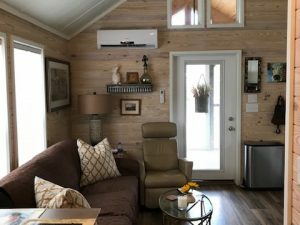 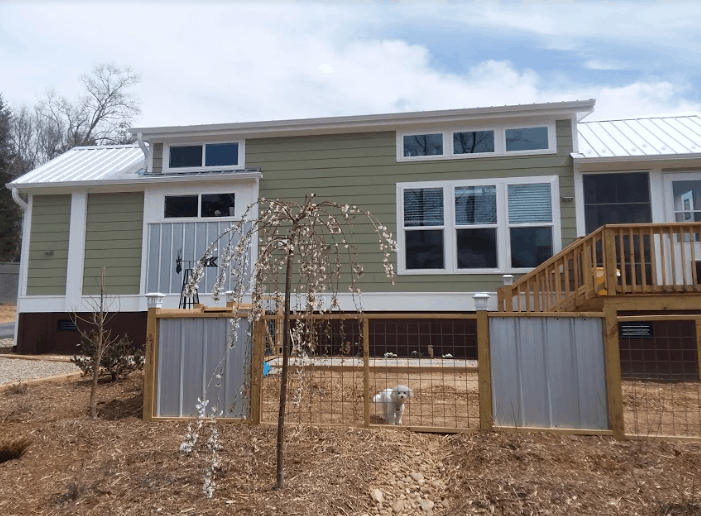 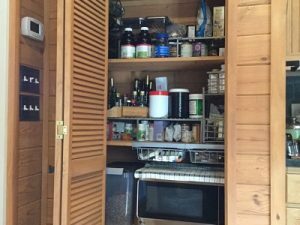 The home also includes a pullout trash/recycling center, an ASKO stackable washer, and dryer in its own recess, and a main floor master bedroom with a private screened porch. 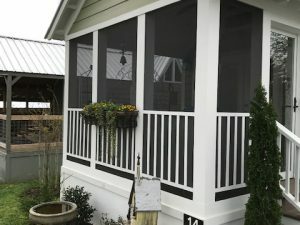 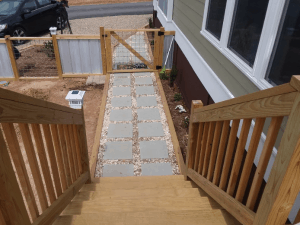 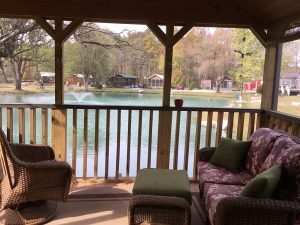 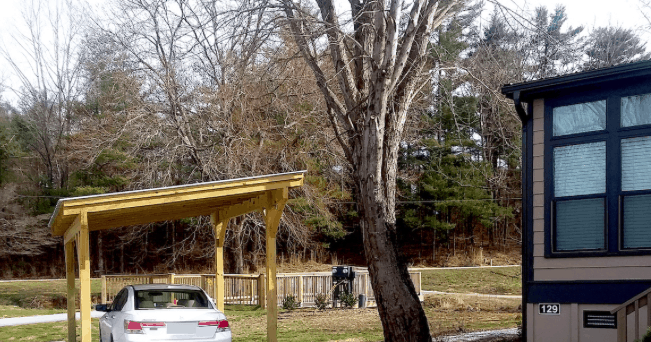 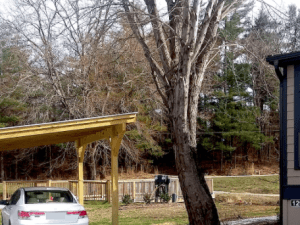 The exterior of the home features a front porch with water views, a 10 x 10 foot storage shed with double lofts and a ramp for easy ingress, and a two-car gravel driveway. 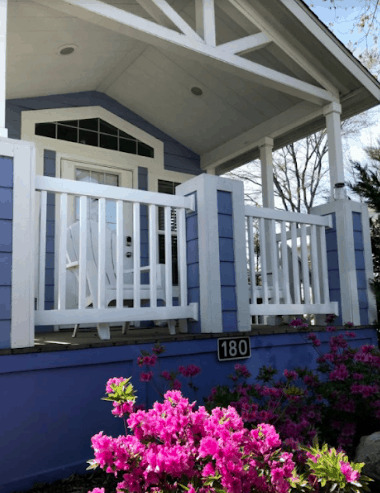 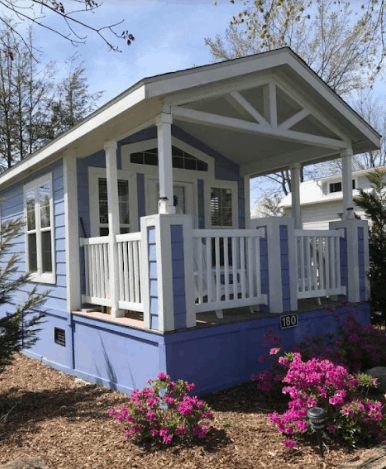 The Lavender House features a cozy front porch that’s built for sweet tea and meeting the neighbors plus lovely mountain breezes! 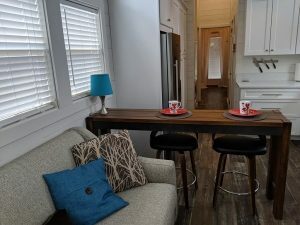 The main living area consists of a kitchen complete with full sized oven, microwave and stove, dining nook, and futon that opens up to a full sized bed. 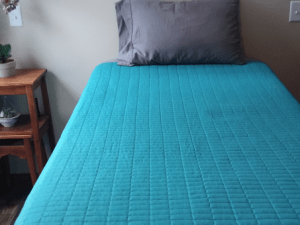 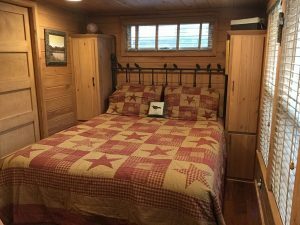 The bedroom has a NEW queen-sized bed and overlooks the farm. 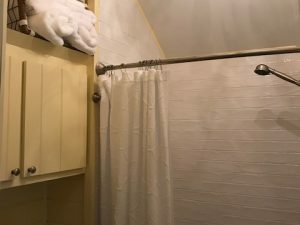 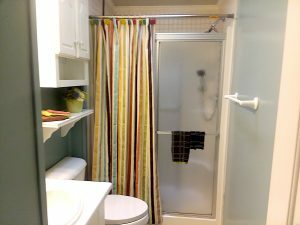 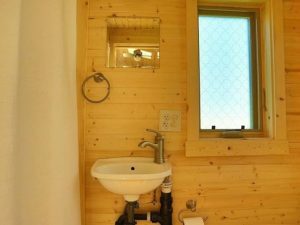 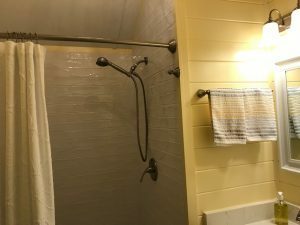 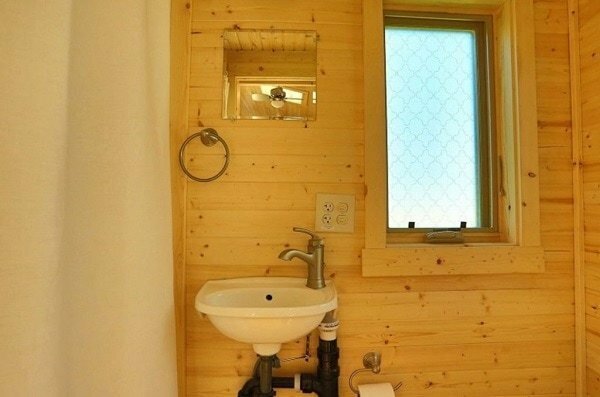 There is a full bathroom complete with bathtub, shower, and sink. 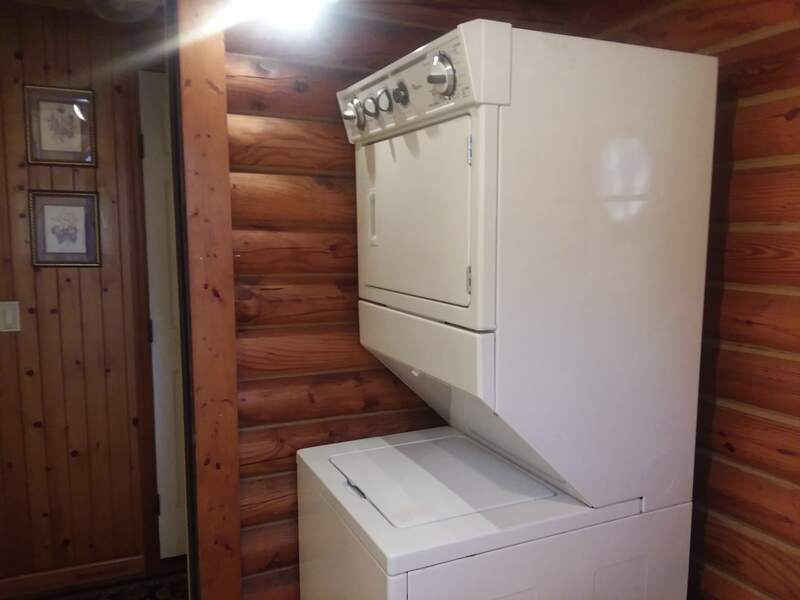 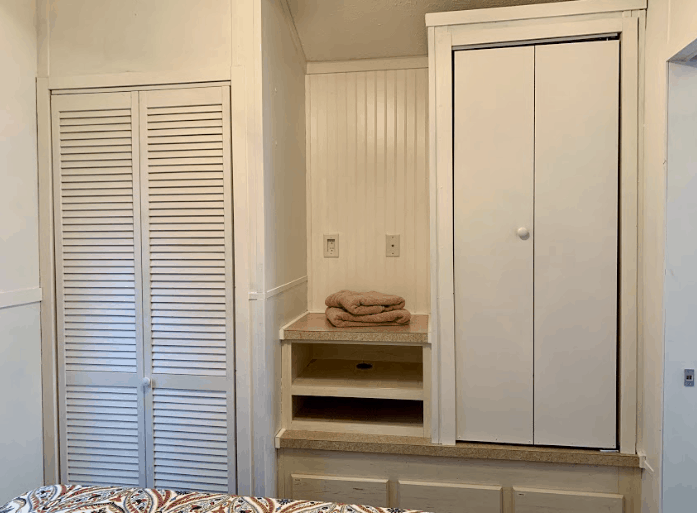 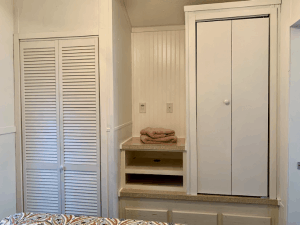 A small stackable washer and dryer can be found tucked away in the bedroom closet. This beautiful 2016 Rustic River 1-bedroom park model comes with unbeatable interior and exterior upgrades! The exterior of the home features a two-car driveway with a carport and custom landscaping including a lovely garden area. 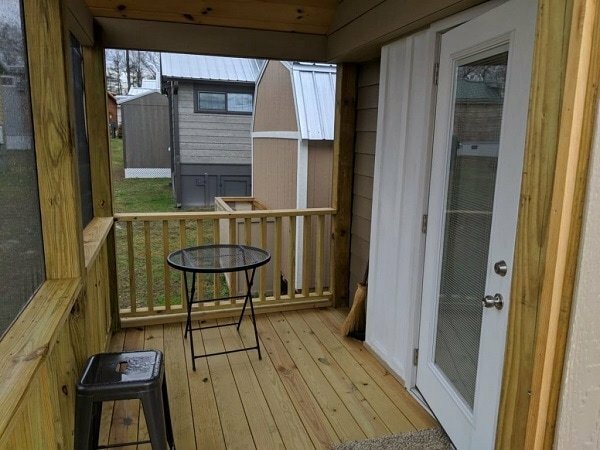 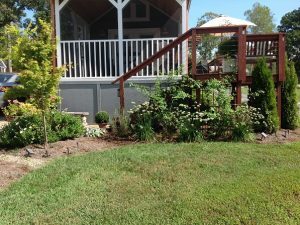 The front porch is expanded for comfortable seating for up to six people and includes a cedar privacy wall, Pella porch storm door, and custom shutters. 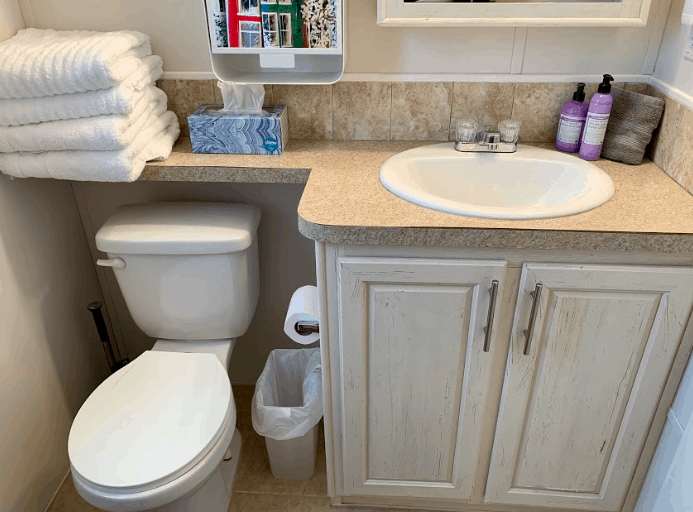 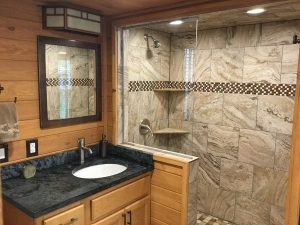 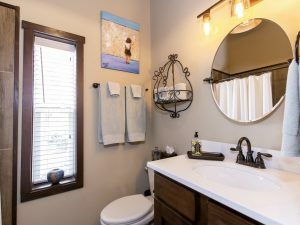 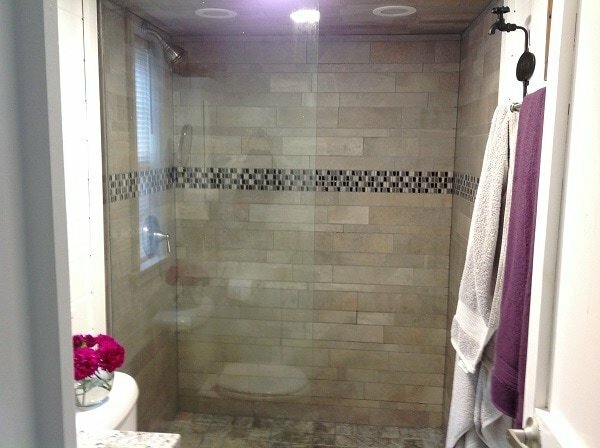 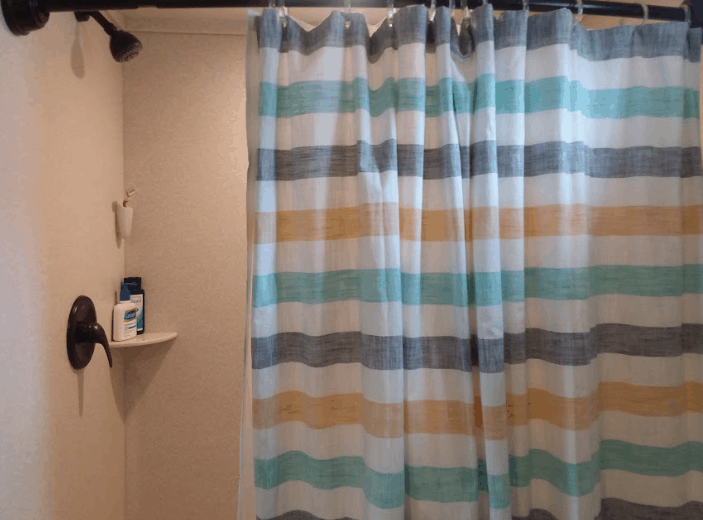 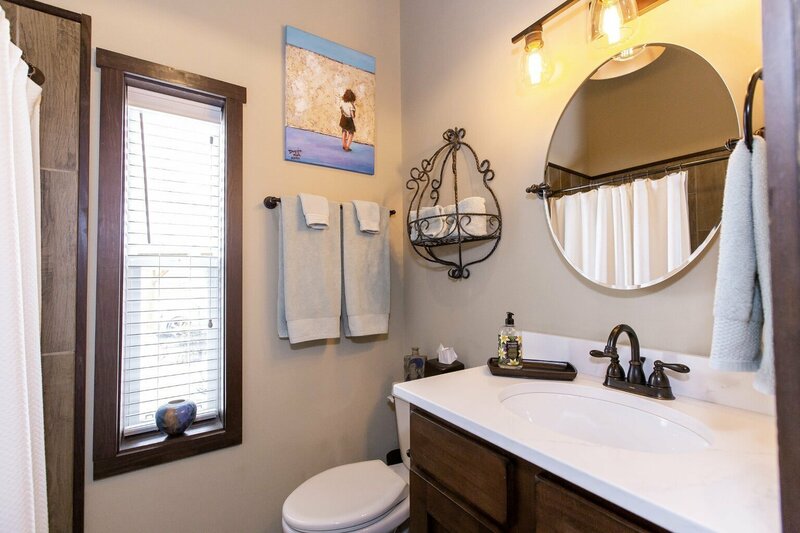 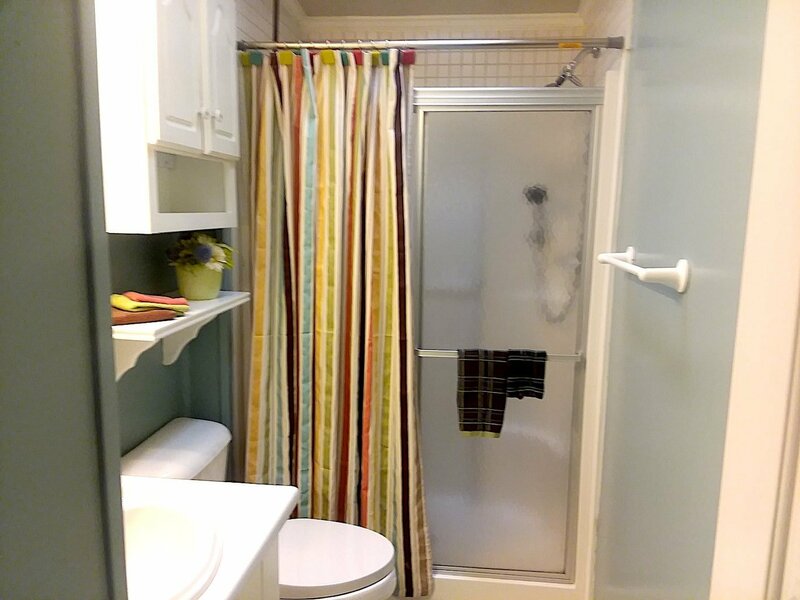 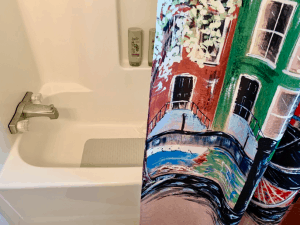 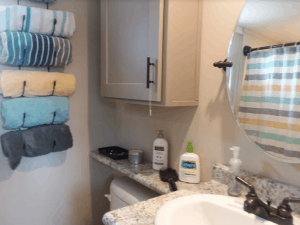 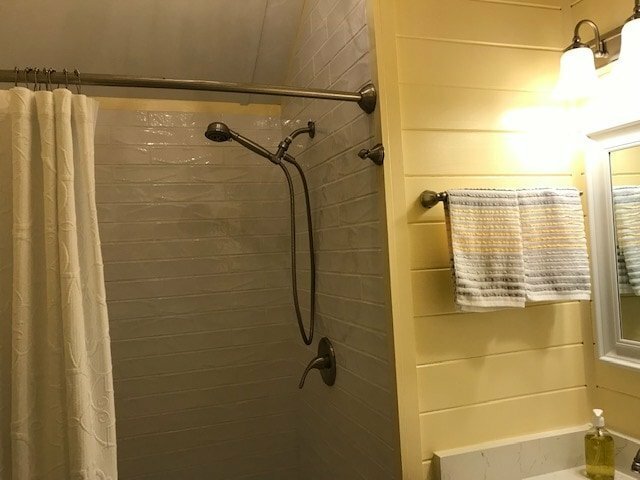 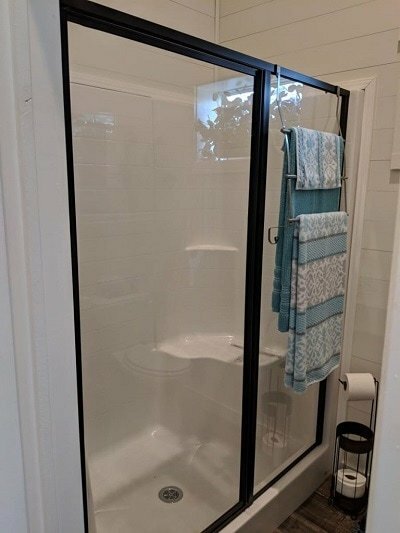 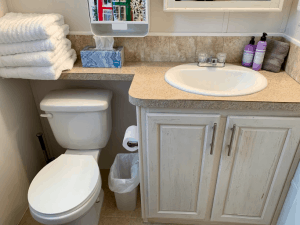 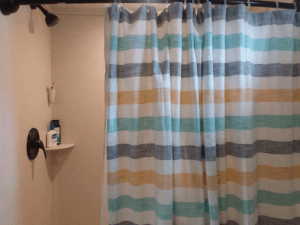 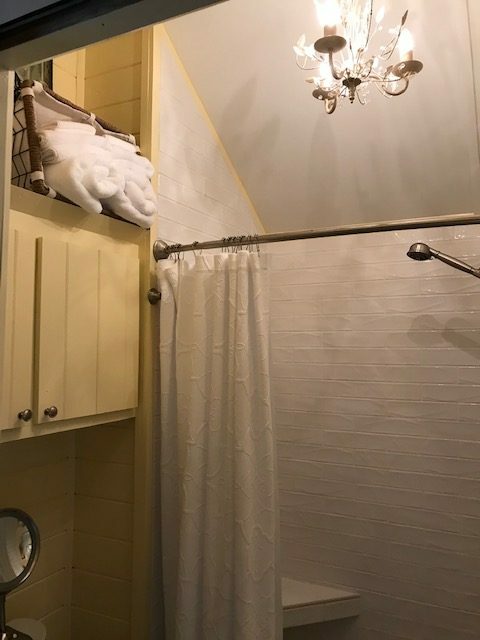 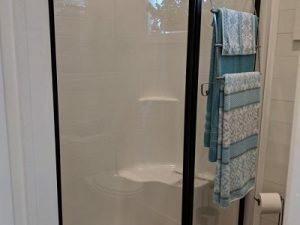 The interior includes an upgraded custom bathroom with a large tiled shower, an upgraded custom kitchen, custom window treatments, custom lighting throughout, and plenty of built-in storage. 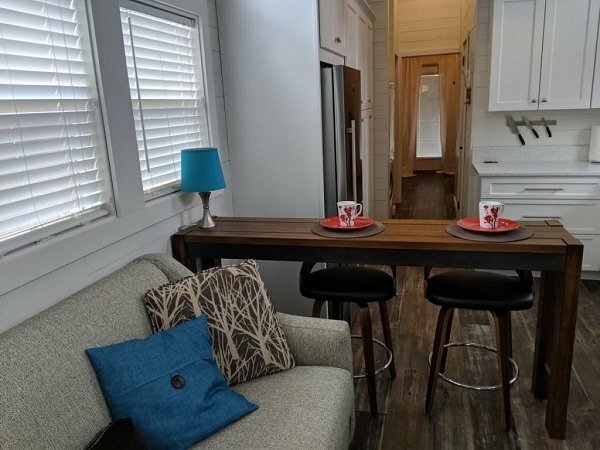 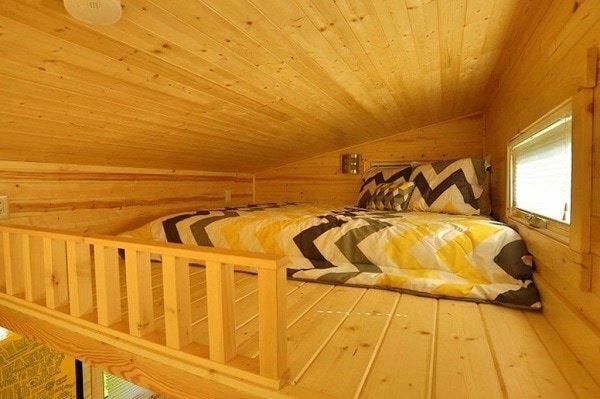 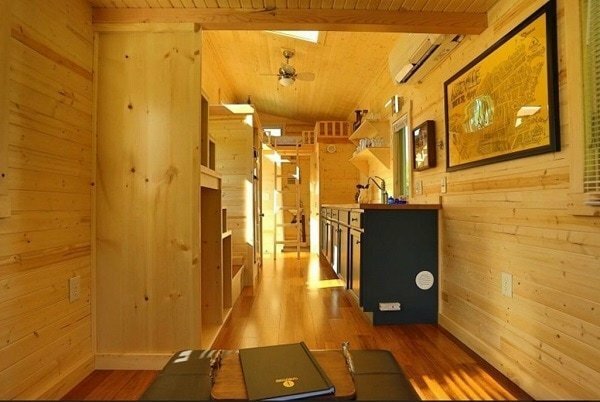 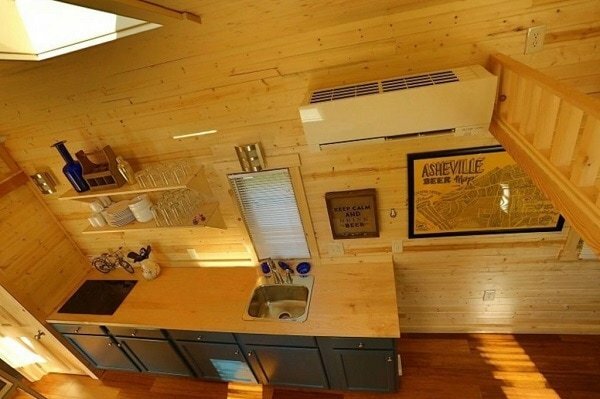 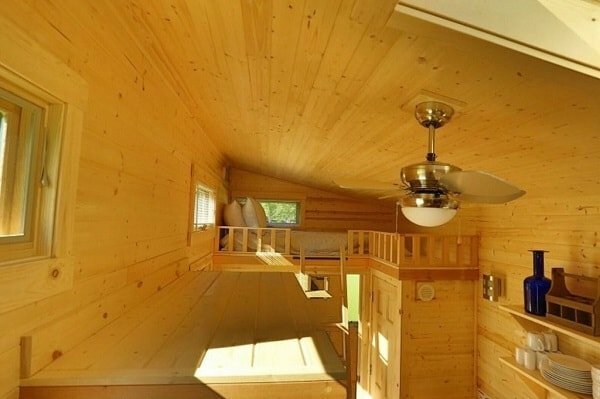 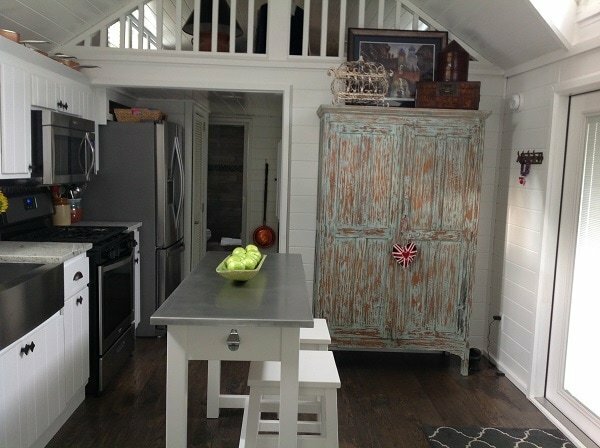 You don't want to miss this one-of-a-kind tiny home! Note: No furniture, living room chandelier, exterior planters, nor yard art will convey with sale. 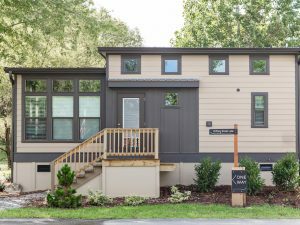 This 2017 Clayton Alexander 1-bedroom park model is highly stylized with beautiful landscaping and interior customization! 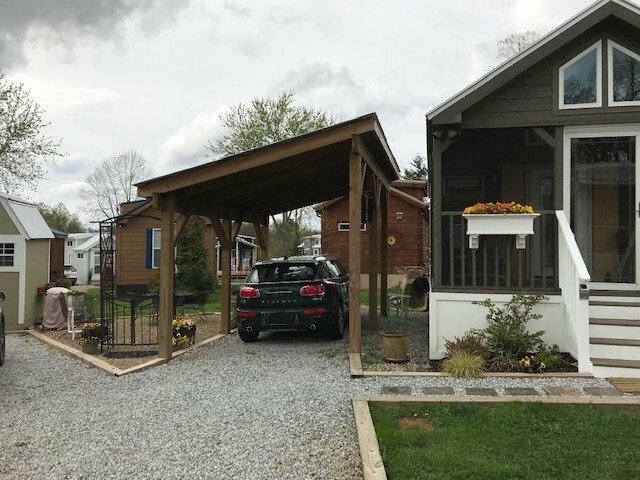 The exterior of this lovely home features a two-car gravel driveway with a storage shed that perfectly matches the exterior of the home. 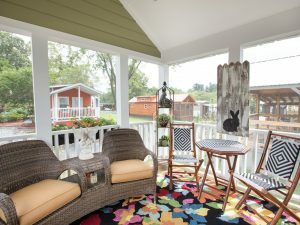 The front porch is screened and covered and features a Pella porch storm door. 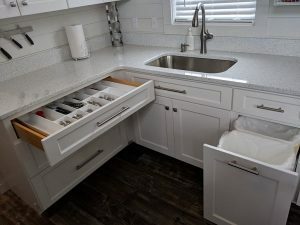 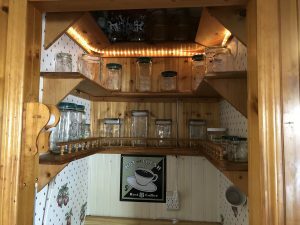 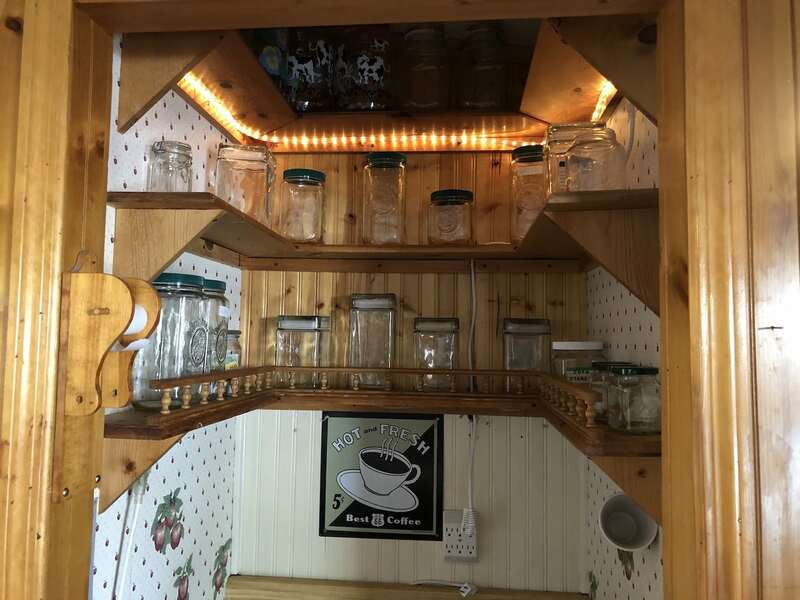 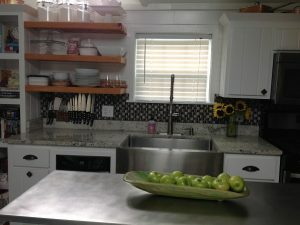 Interior upgrades include custom cabinets and a custom pantry in the kitchen, blinds to block the sun in the living area, a bosc washer and dryer, and tons of custom storage throughout. 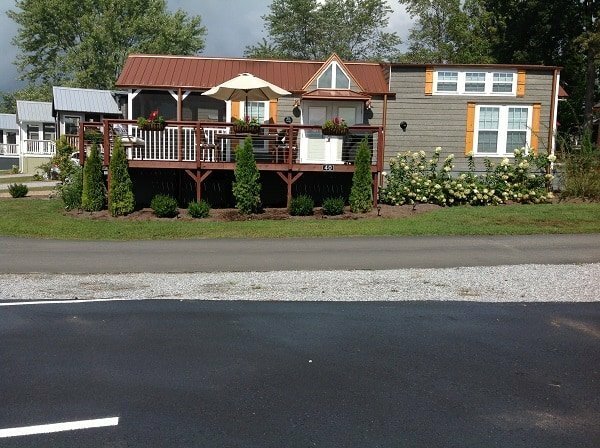 To schedule a showing please call our Sales Office at all 828.707.0969 for email info@simple-life.com. 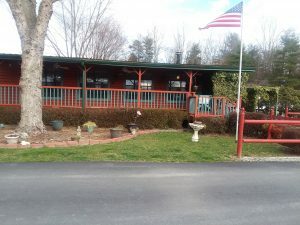 We are open Monday through Saturday 10:00 AM – 5:00 PM. 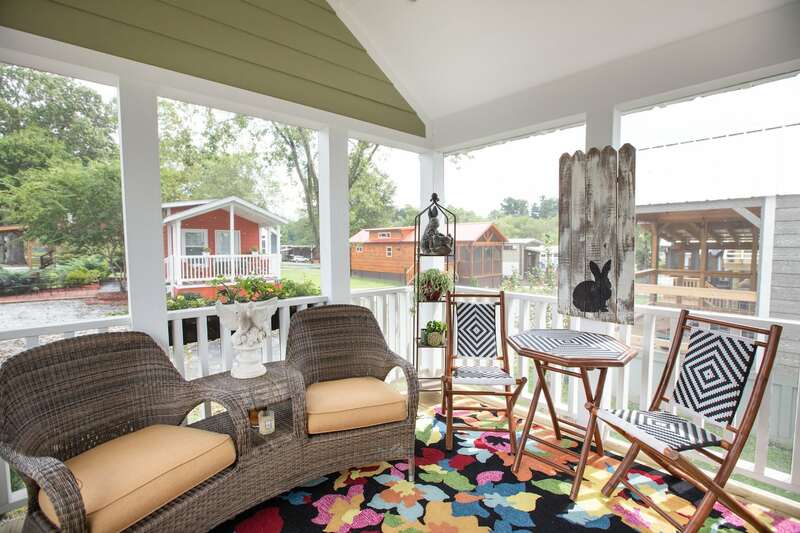 Note: No furniture, exterior planters, nor yard art will convey with sale. 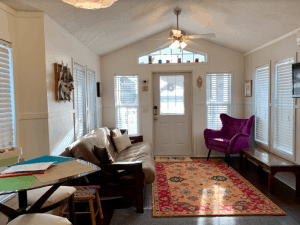 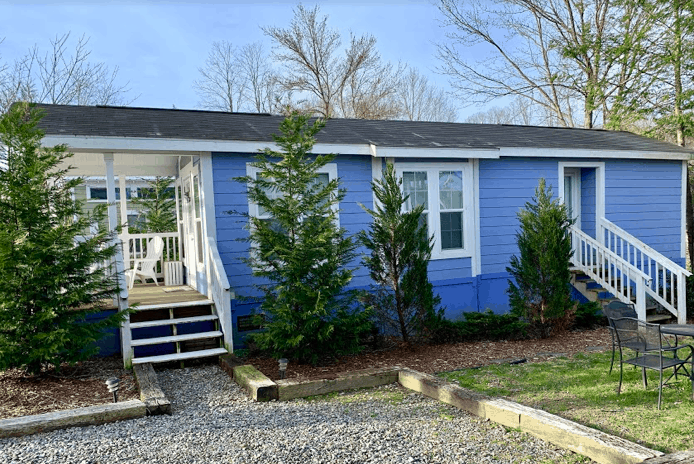 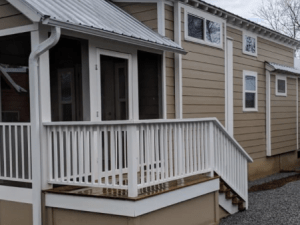 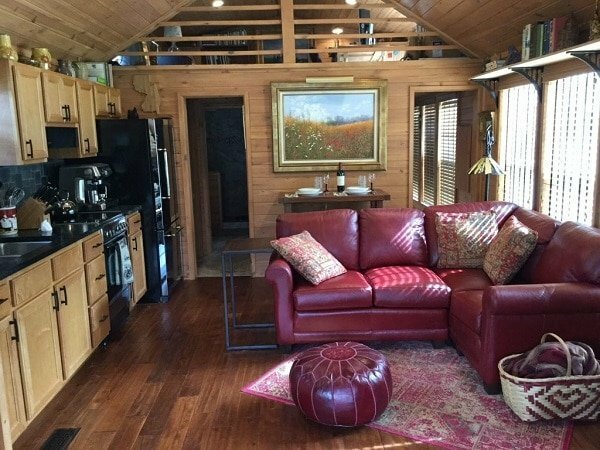 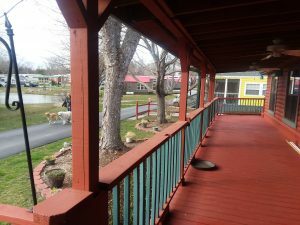 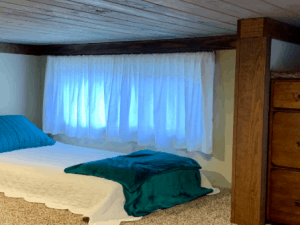 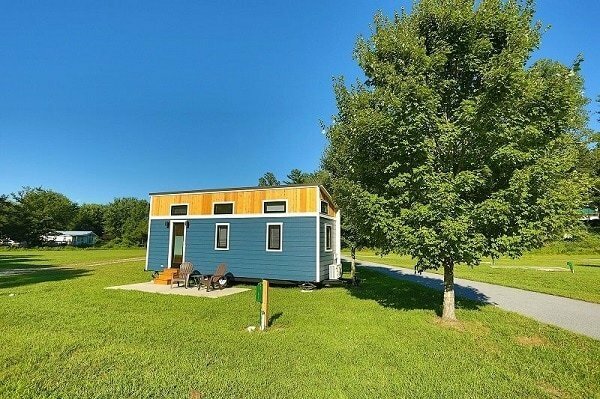 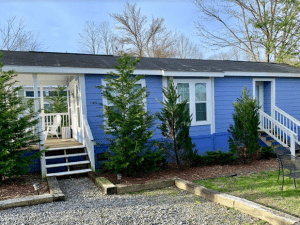 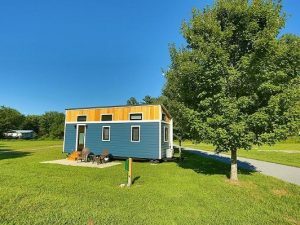 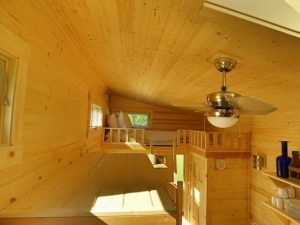 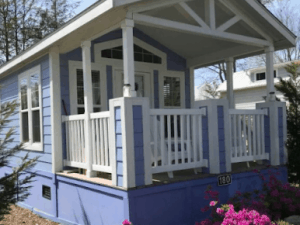 The Blue Ridge Hideaway is a 208 sq. 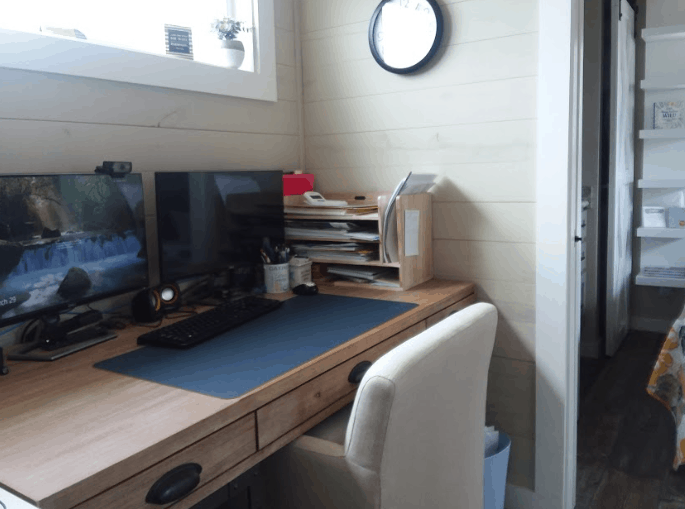 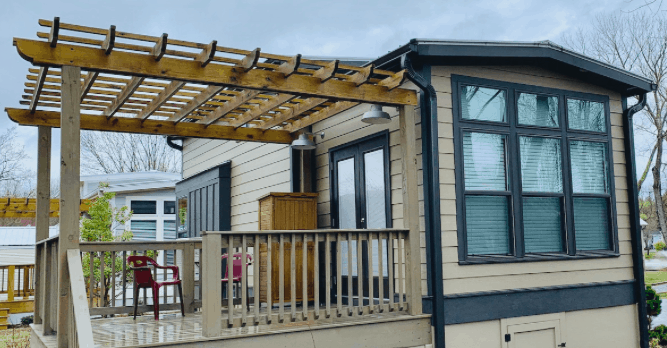 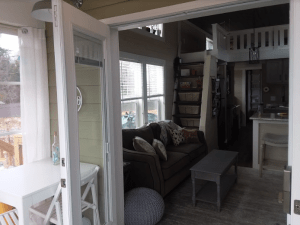 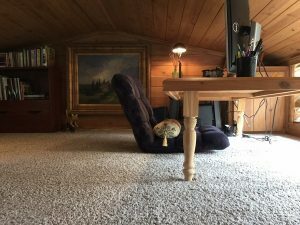 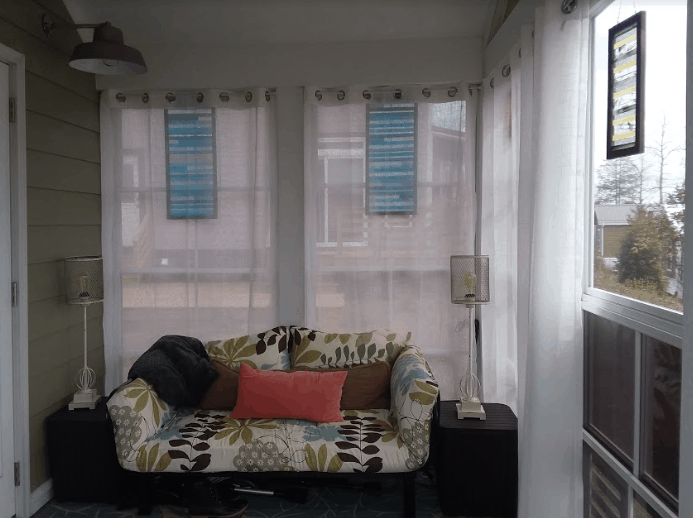 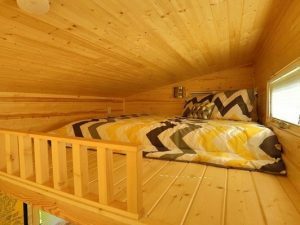 ft. Tumbleweed 26′ Roanoke Tiny House. 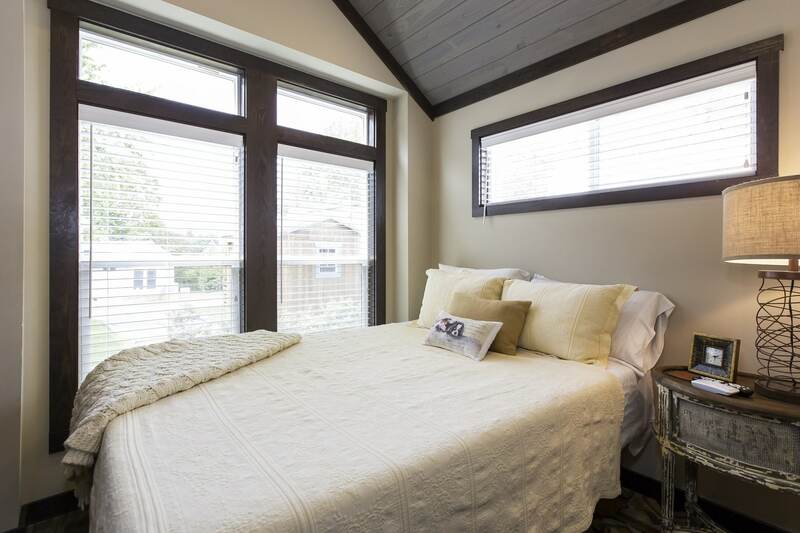 This home features 2 lofts with beds to accommodate 4 guests. 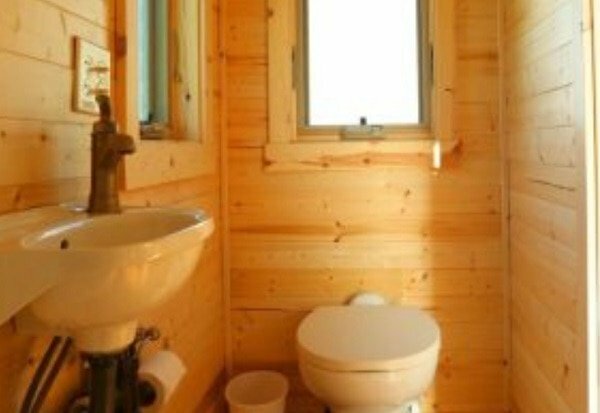 Other perks include a well – equipped kitchen, comfortable open area, bath with flush toilet, walk-in shower, and vanity. 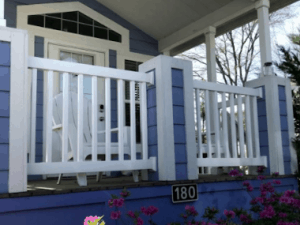 Showing now! Rare Resale! This home is one of the largest cabins in The Village with 644 sq. ft. of interior space. The creative layout includes 2 bathrooms, one with a shower and one with a garden tub, and a large extended living area with several separate rooms. 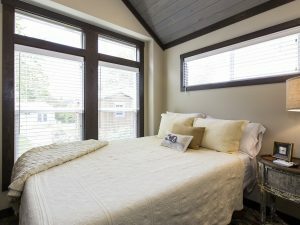 Other features include a walk-in closet in the master bedroom and new stainless steel appliances in the kitchen. 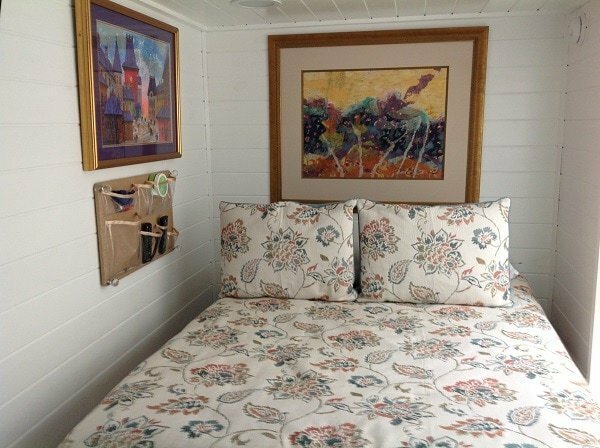 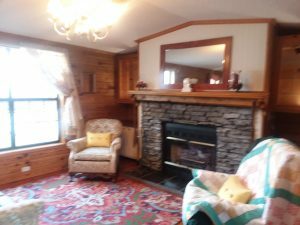 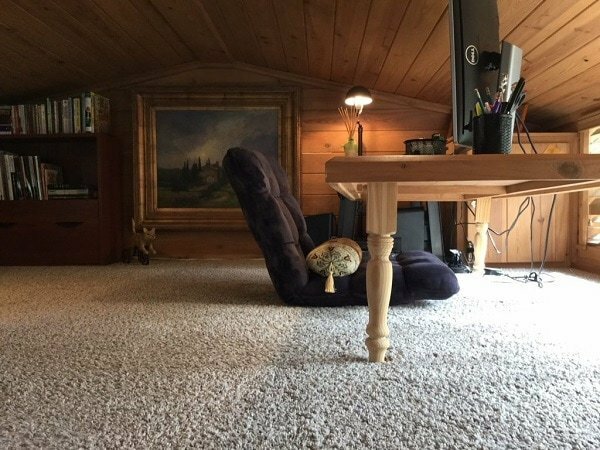 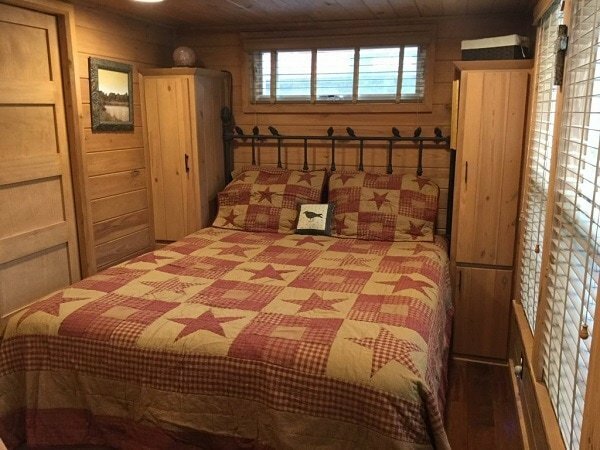 This cabin is located on a generous sized, corner home site and is being sold with or without furnishings. Call 828.707.0969 for a showing Mon - Sat 10:00 AM – 5:00PM. 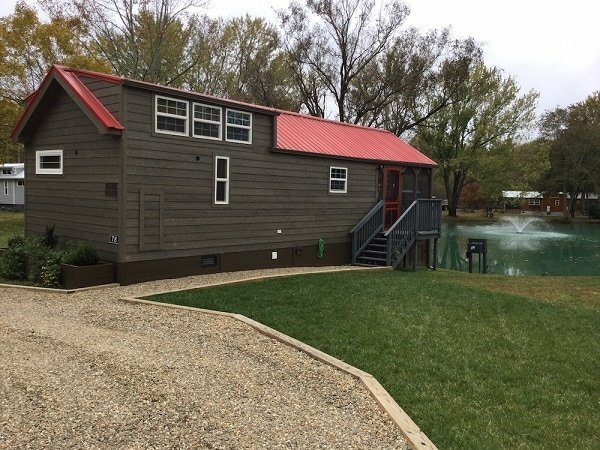 This beautiful home, built by Rustic River in 2016, is located on a rare homesite on Lower Pond. 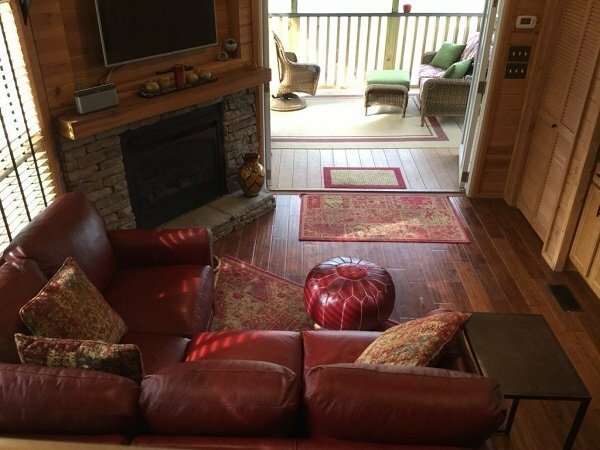 Enjoy gorgeous water views and the peaceful sounds of the fountain from the large screened porch. 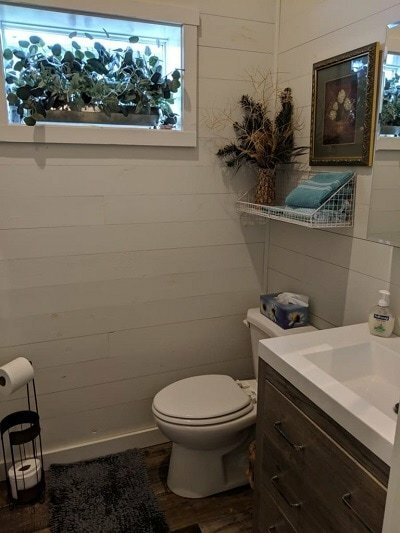 Interior features include a generous loft with easy access stairs, a beautifully tiled walk-in shower, upgraded appliances, lots of custom storage, wood floors, and a stone fireplace. 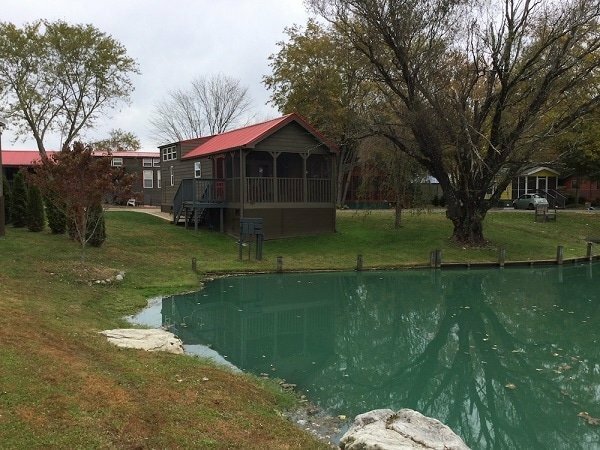 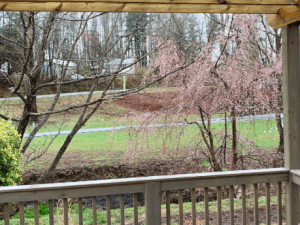 This rare pondside home will go fast! 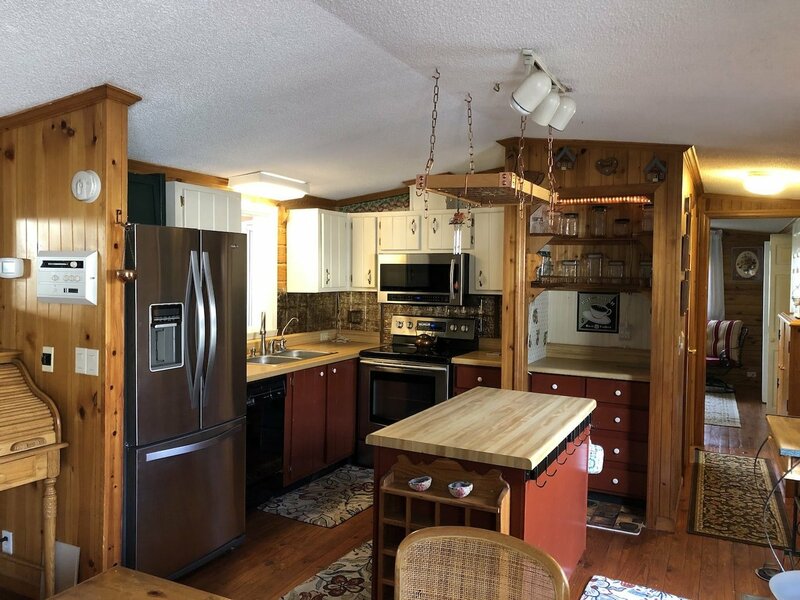 This house requires an appointment to view, to schedule a showing please contact one of our sales professionals at 828-707-0969.